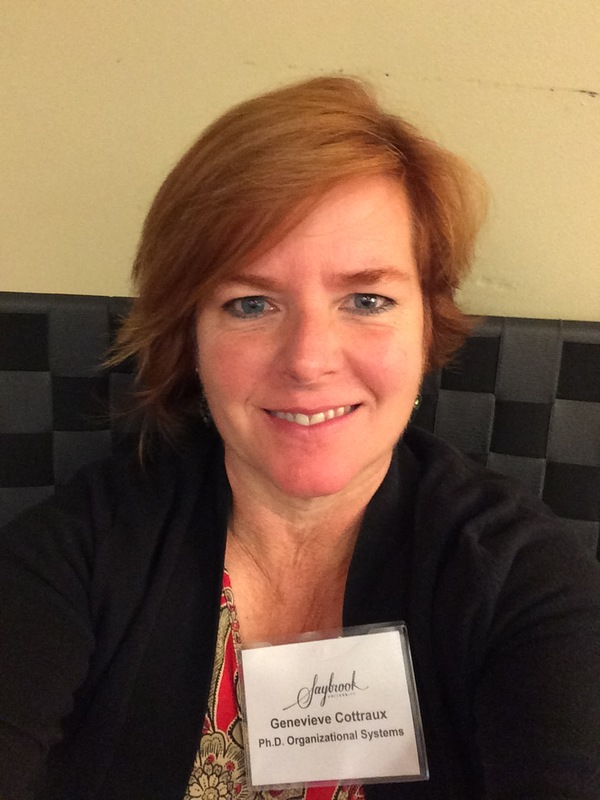 My first experience as a foster mom was 17 years ago. I was working for California State Parks at the time. I was at the Benicia Capitol State Historic Park and Benicia State Recreation Area. 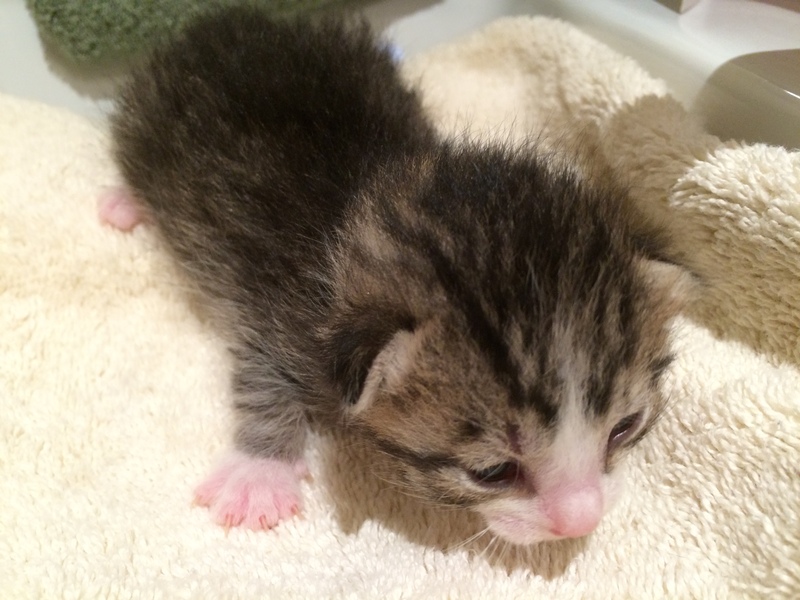 A kind-hearted jogger came across 2 newborn kittens and brought them into the park office. I’d never bottle fed kittens before but I was game to give it a try. I named them Ben and Sara and spent the next few weeks feeding them every 2 hours and rubbing them with warm wet cloths to stimulate their insides to work. Momma cat does that by licking them. I waslucky to work in a place where I could take them with me, and the wonderful volunteers at the park helped me; we all had fun watching them grow. 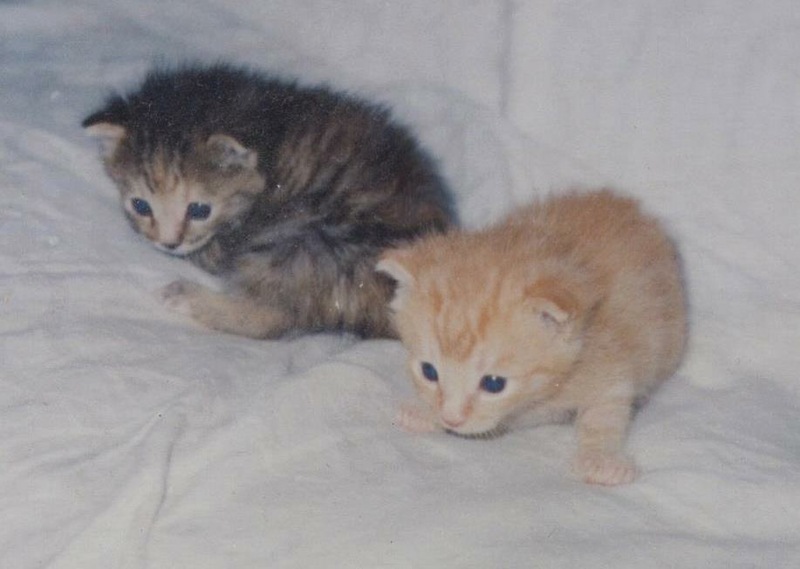 Seventeen years later, Sara (brown tabby) is still with me. 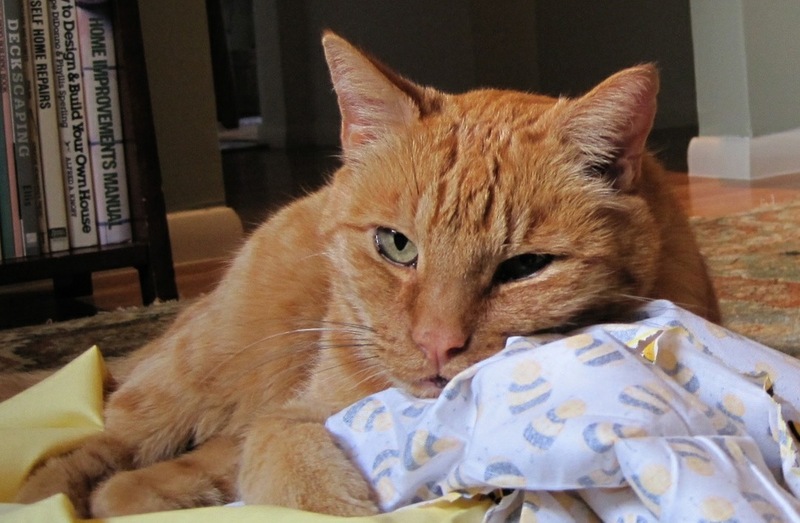 Ben (orange tabby) died of liver cancer in the spring. I miss him greatly! 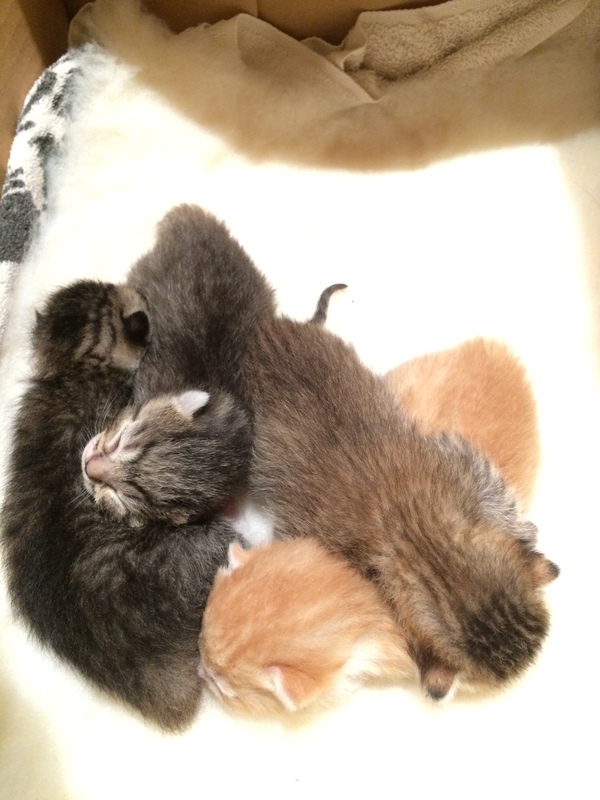 In the foster world this is called “foster fail”, when you end up adopting your fosters. 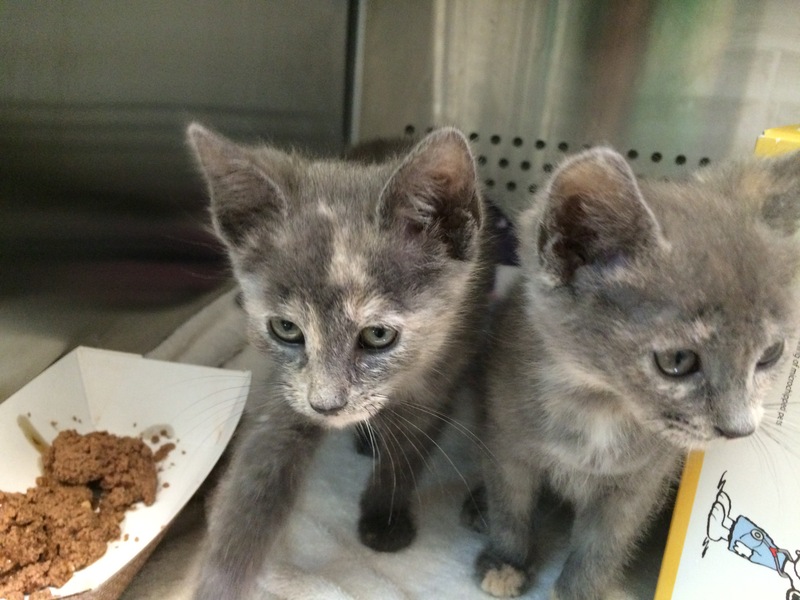 Maybe it should be called “foster success” since they end up in a loving home! 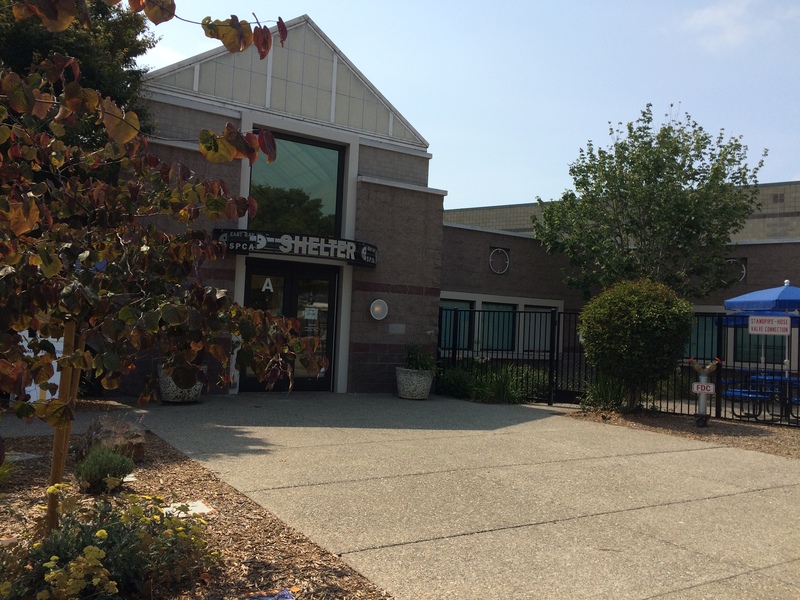 I was reluctant to go that route again, but I want to stay connected with the East Bay SPCA, where I have volunteered for the last 6 years. As a new gradute student, I have a feeling extra and time will be words I don’t hear together for a while. By getting involved as a foster, I can contibute but have more time at home. I started with little Abracadabra, who I’ve written about here. I was at the shelter today and she is now available for adoption at the Oakland Adoption Center. She’s growing! I hope she finds a home soon. The sad thing is that black cats and kittens spend longer in the shelter because people are still superstitious about them in the 21st century. After having so much fun with Abracadabra, was ready to do it again. 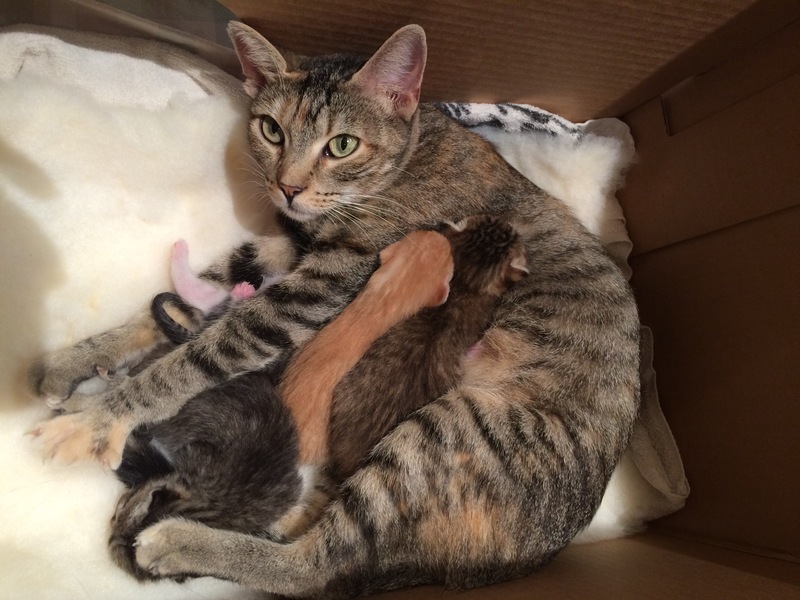 The wonderful staff at the East Bay SPCA were looking for aomeone who could take a mother cat with 4 newborn kittens. It’ll be easy, they said; you take care of the mother and she takes care of the babies. 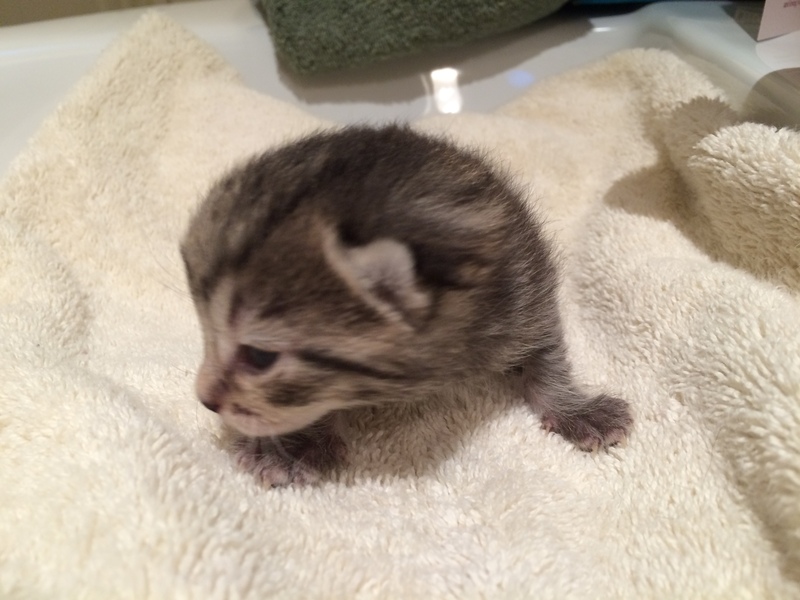 I figured that would work with my busy schedule, so the kitten nursery was established in the guest bathroom. Mother cat Mouse with her 6 day old babies Sugar Glider, Ferrett, Chinchilla, and Ratticus. 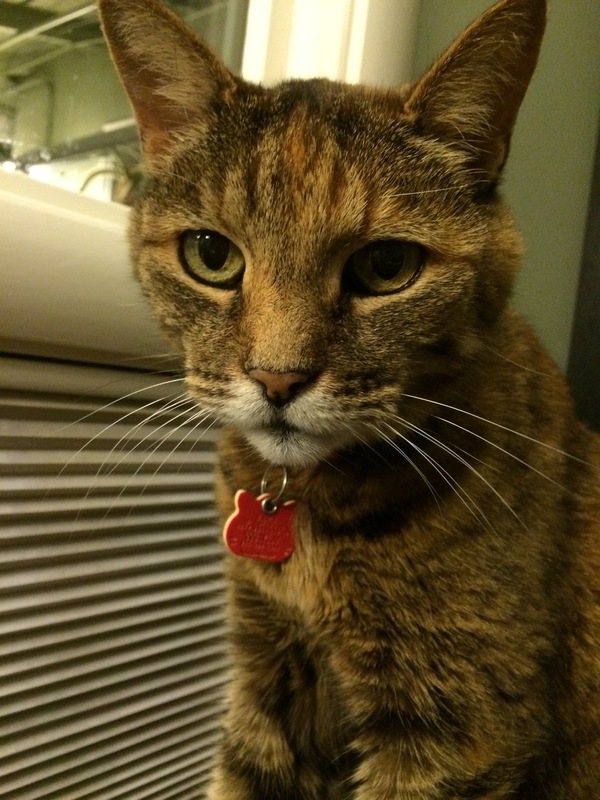 Mouse is one of the sweetest cats I’ve ever had the pleasure to spend time with. And even though she is very young herself, she is an exellent mother. It was suggested that I take daily pictures to document the changes as the kittens grow. I missed their 7th day, but today I start with the daily shots of their progress. Here is Day 8. Their eyes are just starting to open. So far the biggest challenge is getting Mouse to eat enough. Understandably, after being moved from a county shelter to the SPCA and then to my house with newborn babies, she is little unsure of her surroundings. She didn’t eat the first night but has been showing more interest in food. She’s eating for 5, so she needs a lot of calories! 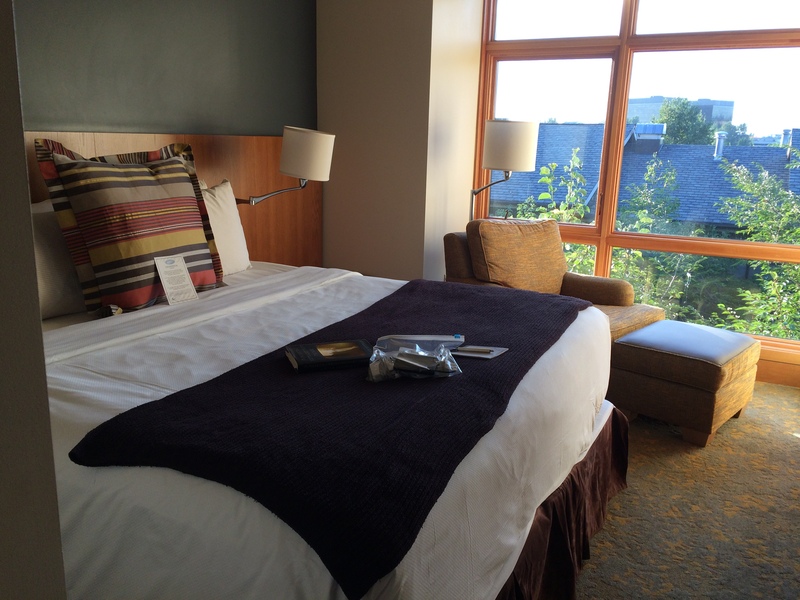 After much agonizing over saving for a rainy day versus following my heart, I decided to go for it and head to Seattle and start a doctoral program. I am intimidated by the sound of it myself; I am starting on a PhD in Organizational Systems, emphasis Humane Education. 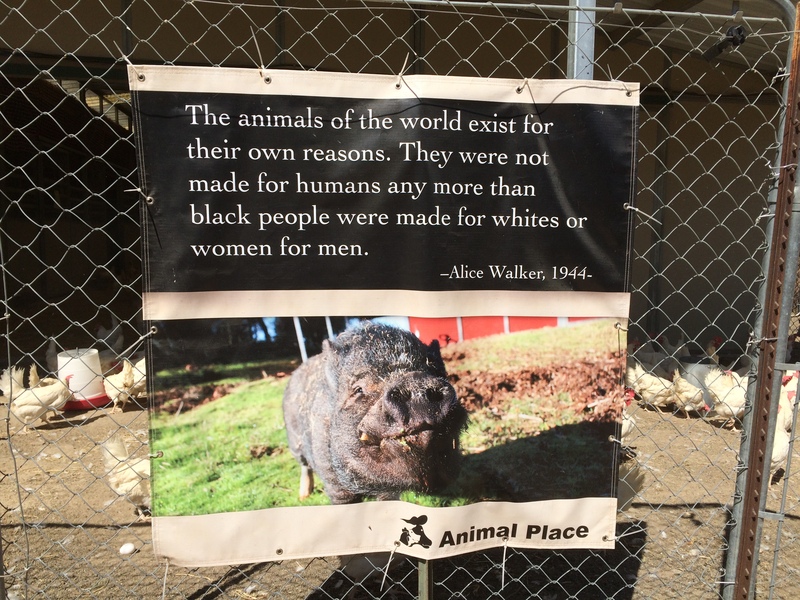 I am not sure where my research will take me at this point, but I know I want to look at animal sheltering, animal welfare, animal agriculture and farm sanctuary among other possible topics. 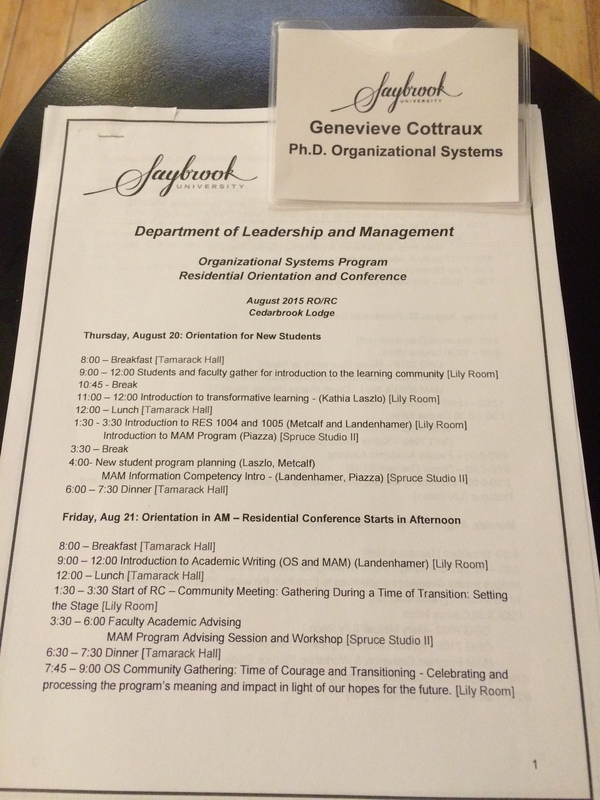 The program, through Saybrook University, requires all new students to attend a residential orientation conference for two days, followed by a residential program attended by all of the students, new and continuing. 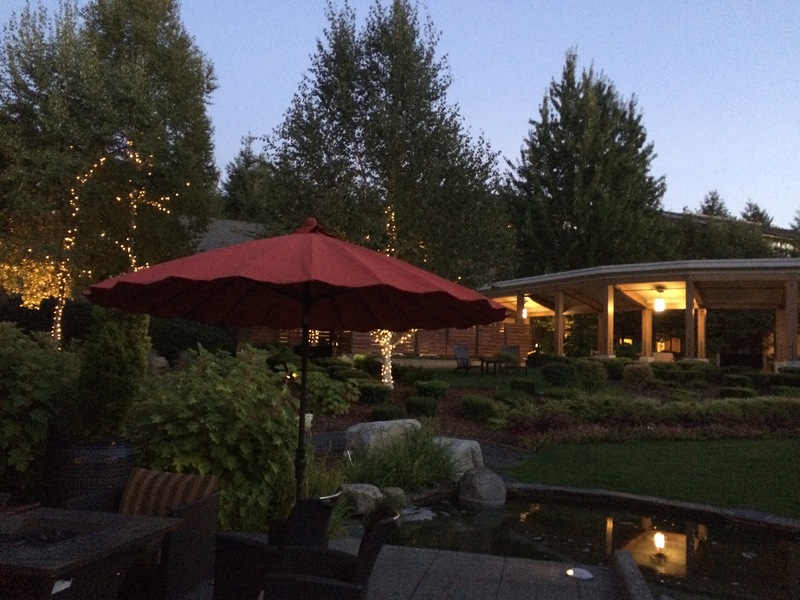 I am in Seattle for a total of 6 days at the lovely Cedarbrook Lodge. Today is Day 4, and we have a little free time (a little). 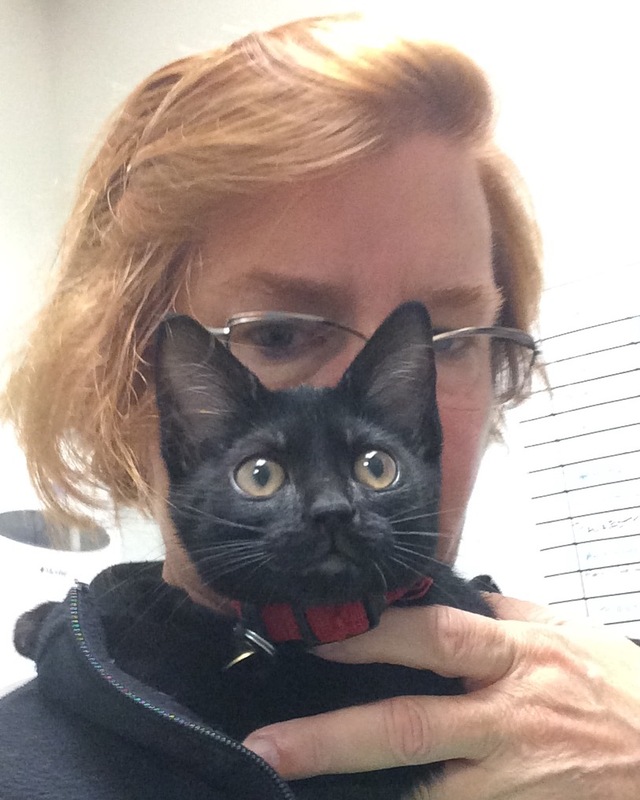 Of course, before I could leave Oakland, we had to say goodbye to foster kitten Abracadabra. 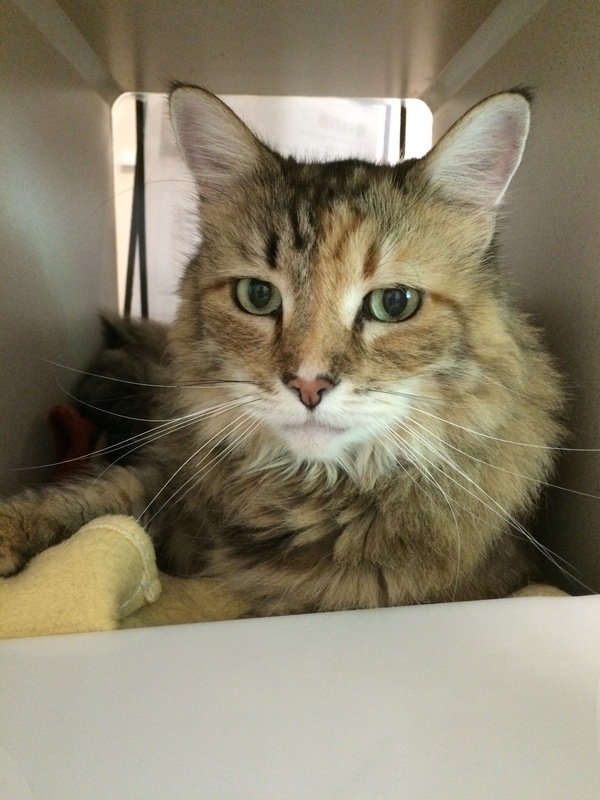 She had gained enough weight to go back to the shelter for spaying and vaccinations to go out to the adoption center and find her new family. Good luck little Abby! It was hard to say goodbye. I am an anxious traveler, and don’t travel alone that often, so this felt like I was going on a big adventure. 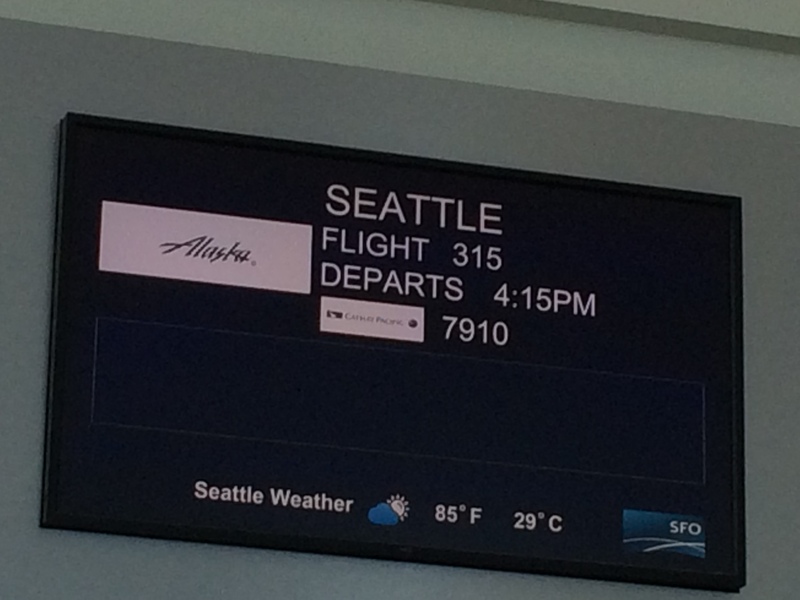 I checked in at the Alaska Airlines counter in the International Terminal of San Francisco International Airport and had to go through the misery that is security screening with a very many international travelers even though my flight was domestic; it took quite a long time. But the International Terminal is quite nice otherwise. 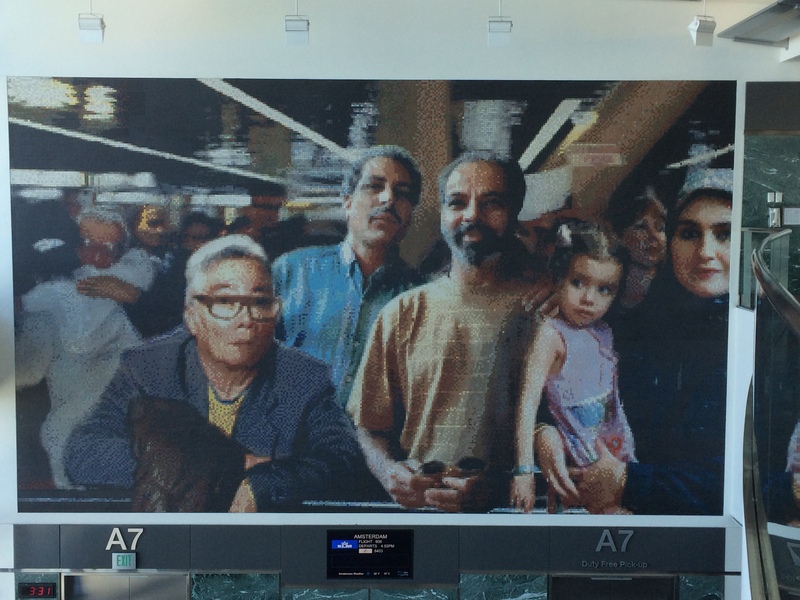 This mural is before you hit security. 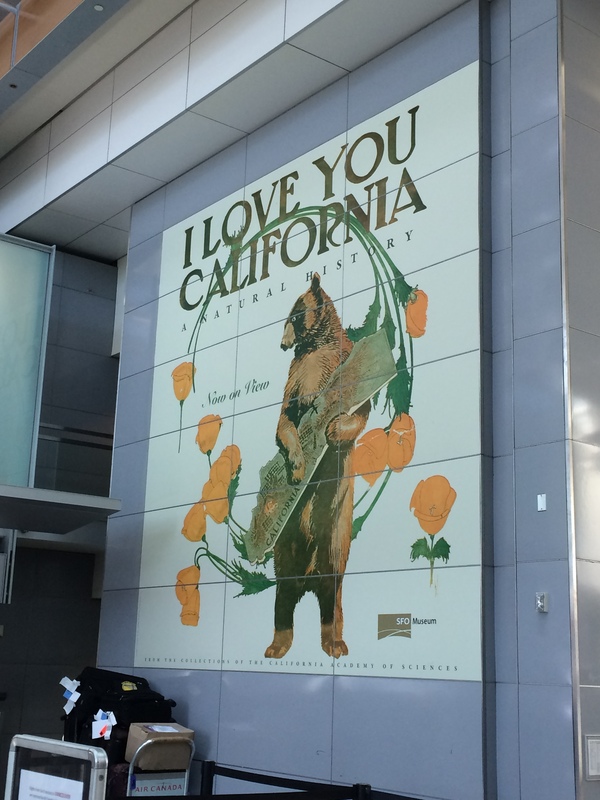 You might not love California quite as much afterward. After a coffee (why does soy milk cost 75 cents more than regular at a coffee place? 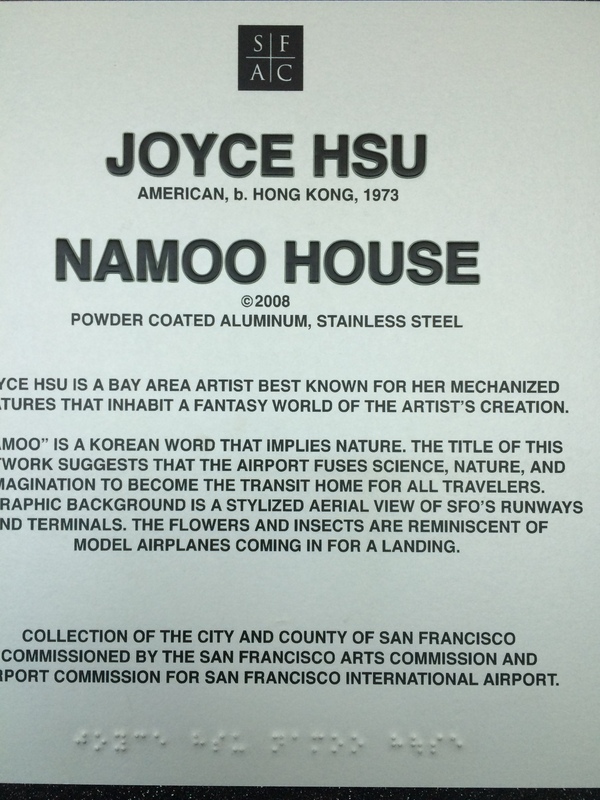 ), I headed to my gate. Right across the aisle was a flight for Paris. Too bad the conference isn’t there! 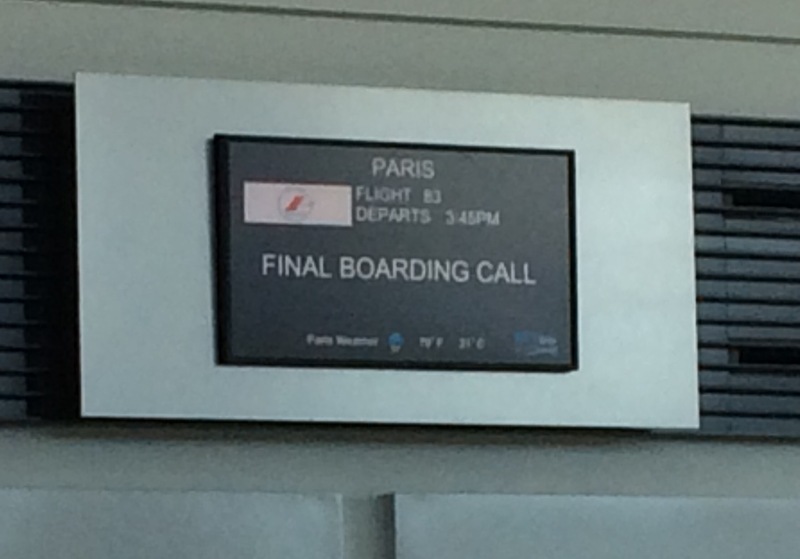 Seattle is a nice place, so I went to my correct line and didn’t try to sneak on the Paris flight. How civilized; there are charging stations at every seat on the Alaska Airlines flight. 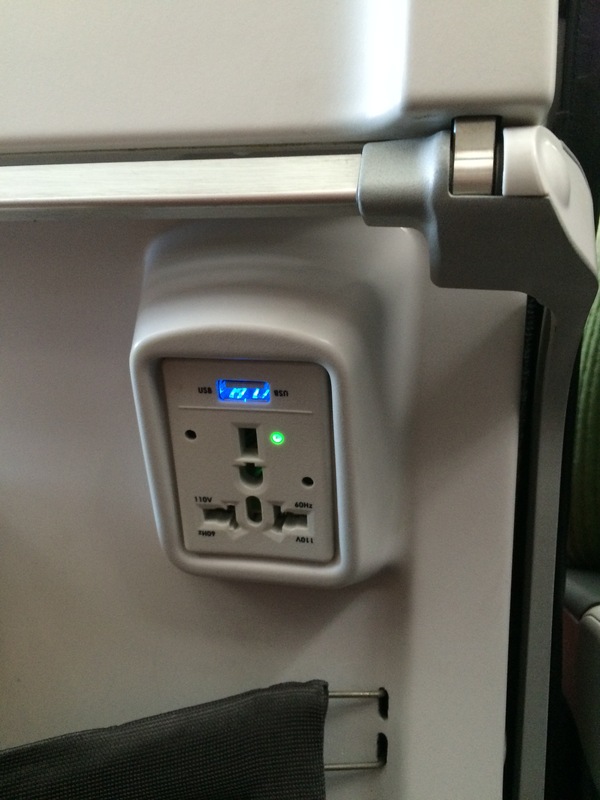 All planes should have these. 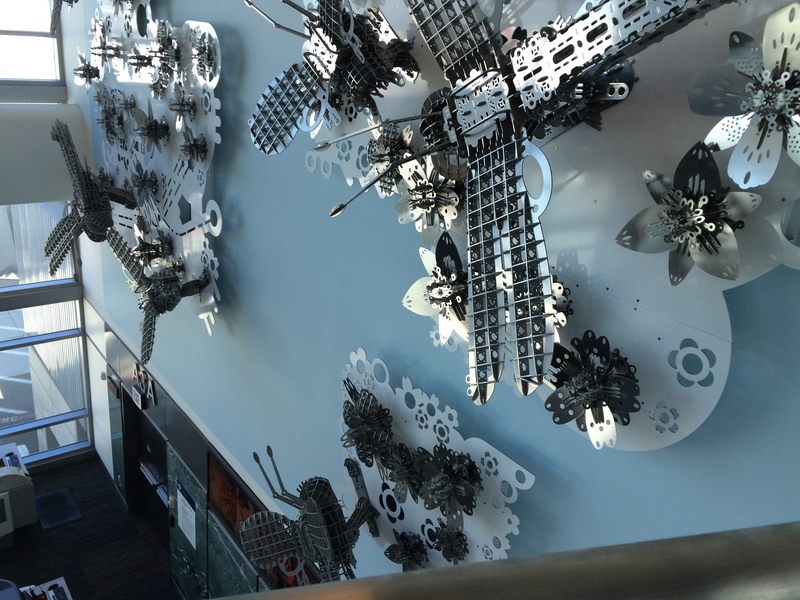 On arrival at Seattle-Tacoma International Airport, I was pleasantly surprised by how clean and, dare I say, pretty, the airport is. 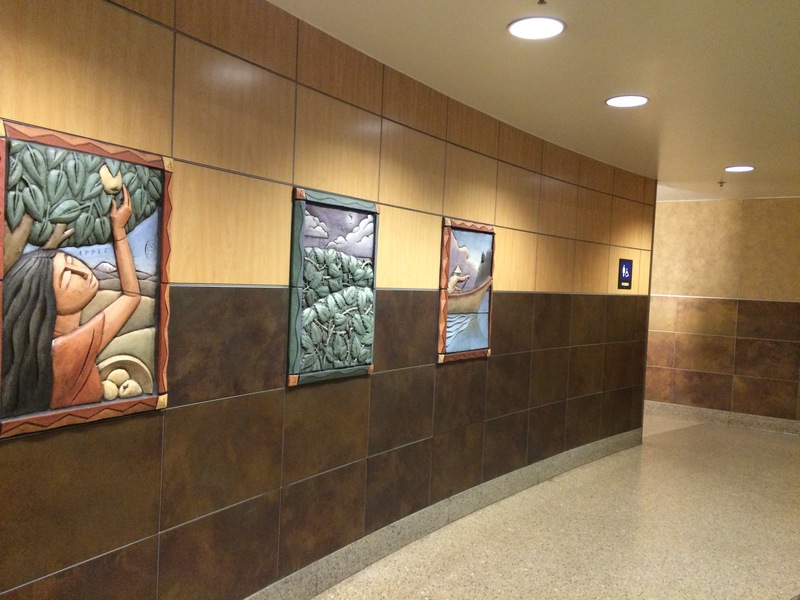 Even the bathroom is pleasing to the eye! 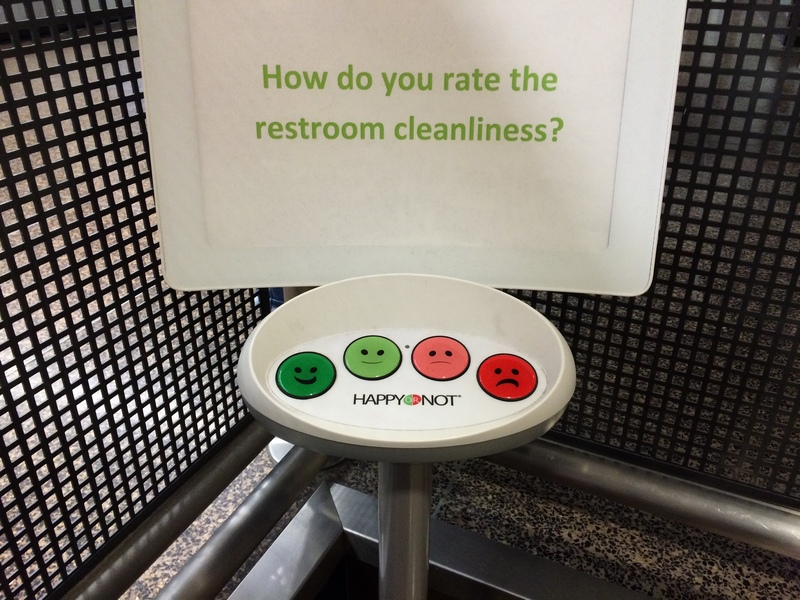 And you can rate the cleanliness; it was “smiley face” clean. Everything was so well signed and accessible that I had my bag at baggage claim and was on the Cedarbrook shuttle in what seemed a matter of minutes. 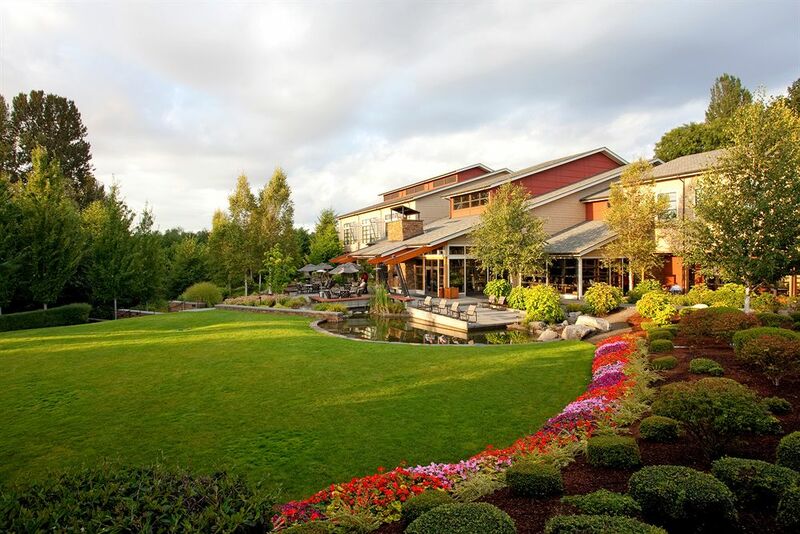 The lodge is remarkably close to the airport but it is anything but your traditional airport hotel. You feel like you are miles from everything! 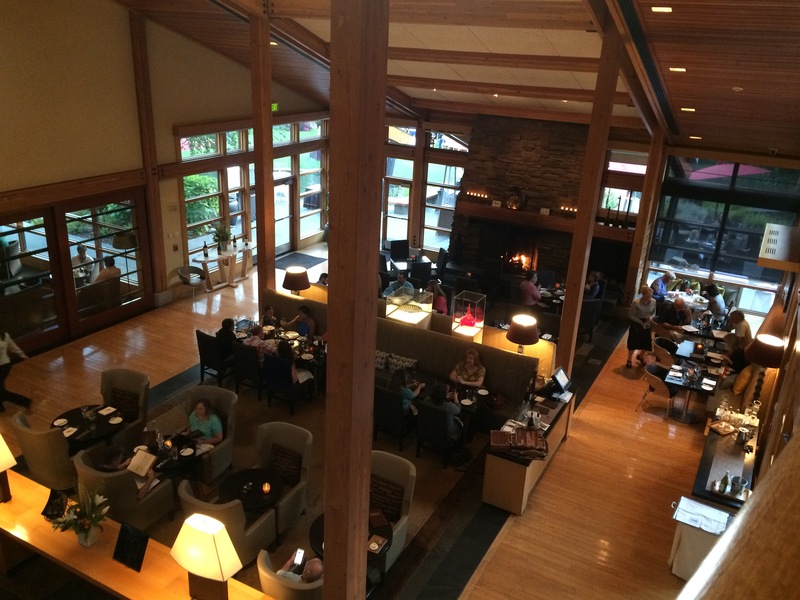 I decided to pay for the luxury and ease of dinner the the lodge’s Copperleaf Restaurant. I am not used to eating in restaurants alone, so I took a book (Alice Hoffman, The Museum of Extraordinary Things), but I was too busy taking pictures and eating delicious food to get much reading done. 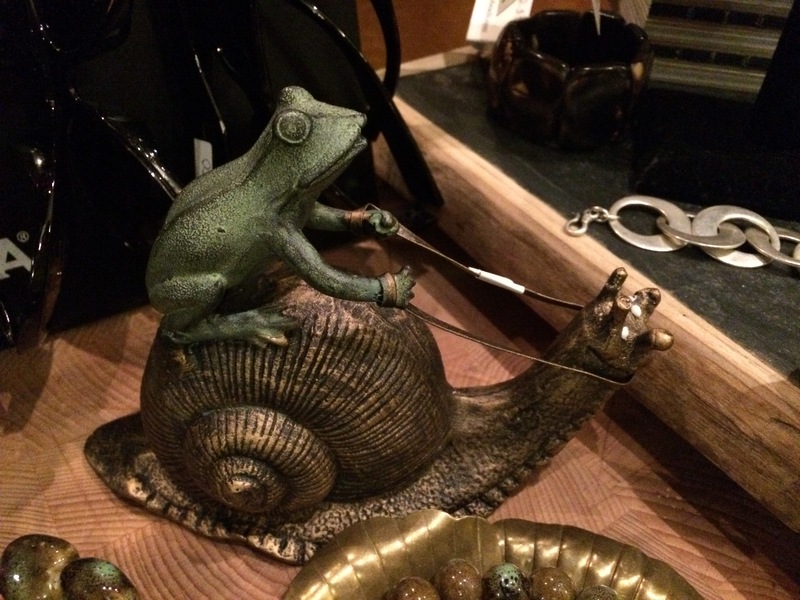 I was intrigued by the table decorations; a frog riding a snail was the best. They sell them in the lodge’s gift shop. Might have to get one! The conference started bright and early the next morning. Signed in, got my agenda and name tag, and tried not to get any more anxious than I already was. It’s been a jam-packed few days but I have learned a lot, made a whole new group of friends, and been inspired to affirm that I made the right decision. 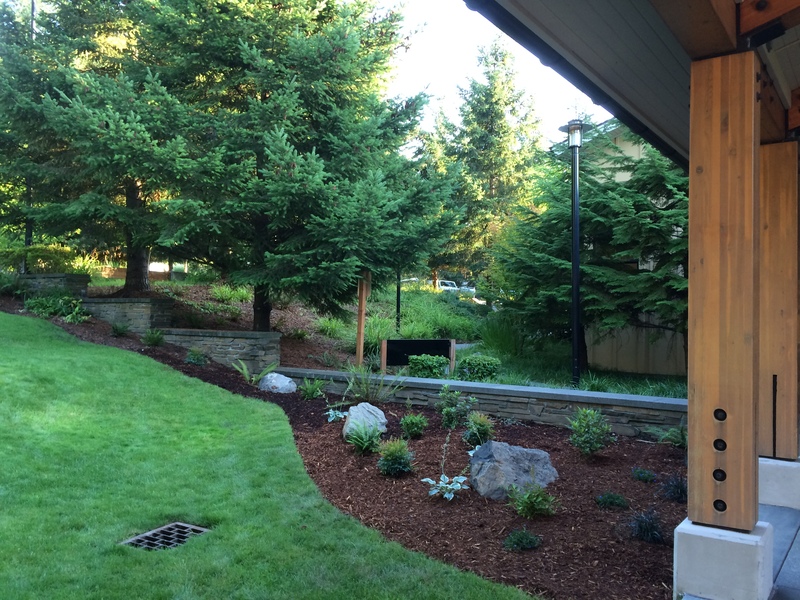 And 6 days at the lodge is not a bad thing! 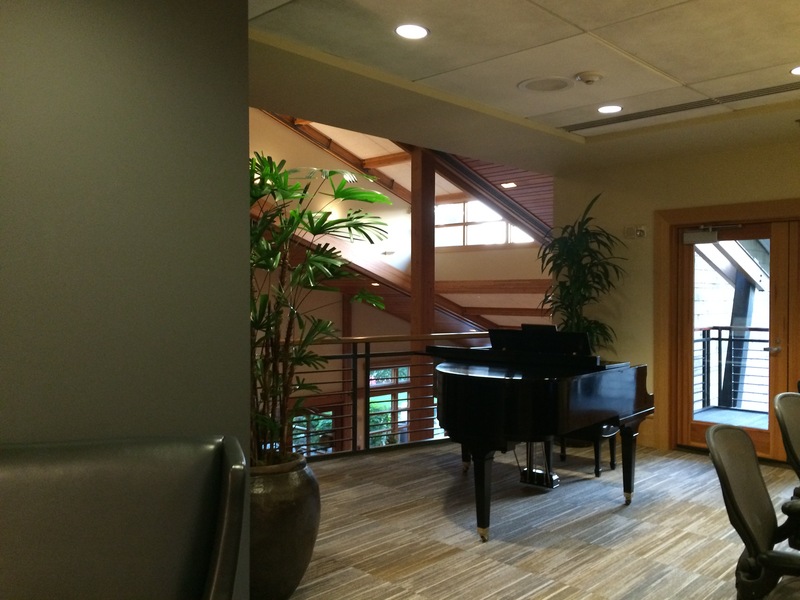 There is even a piano in the business center. 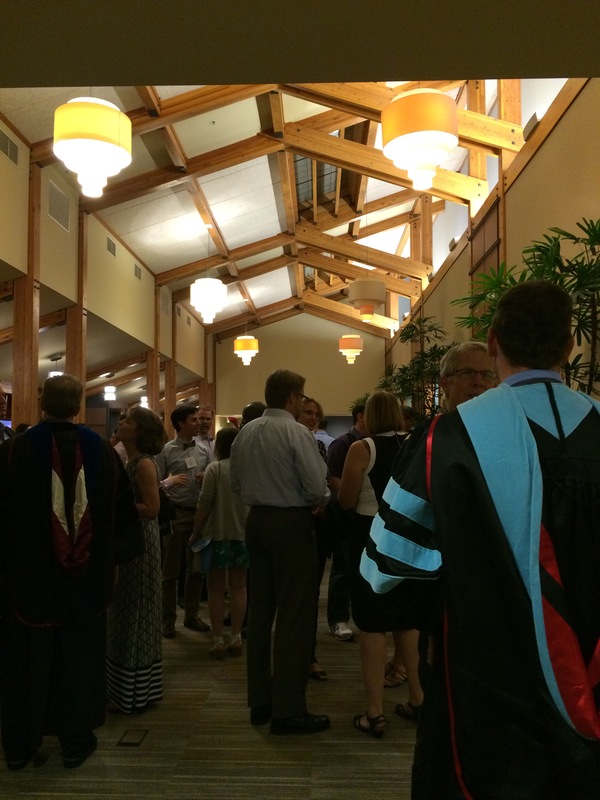 Last night was the graduation ceremony for the 2015 graduates. It was very inspiring and I covet the velvet sash that I too will wear if I play my cards right (well, if I work hard). 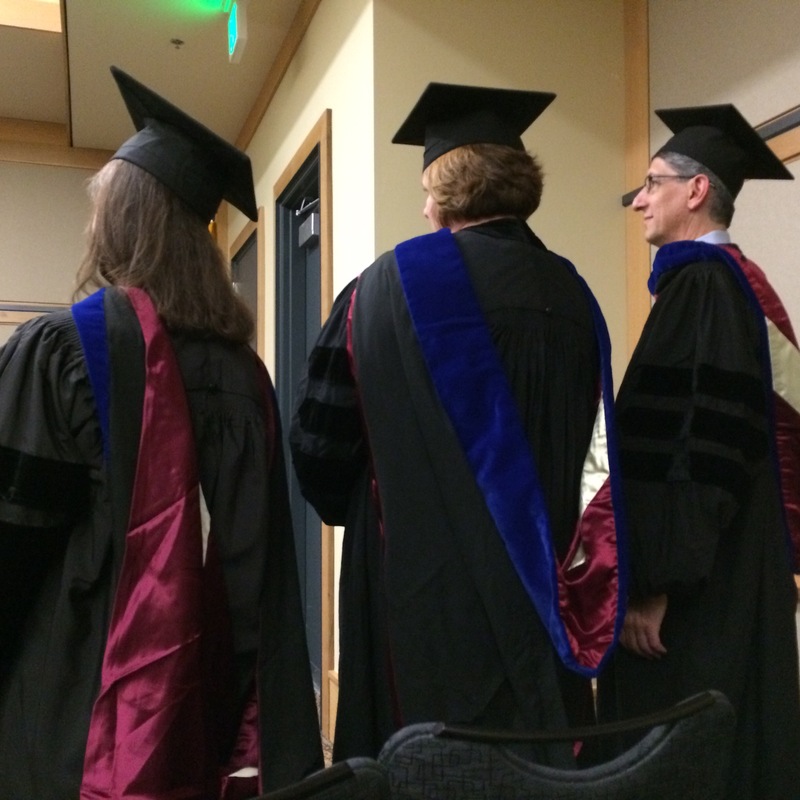 I am exhausted, overwhelmed, apprehensive, inspired, excited…but this is an amazing and supportive group of faculty and students and we are all on each others’ sides. I will be glad to head home on Tuesday evening, but I will also be sad to leave this amazing learning community to start doing the distance education work. That’s the plus side of social media–we can all keep in touch and keep our community going even thought we are spread around the country (and globe). Still smiling! It has been unusually hot for the Bay Area of California the last few days. Maybe it was earthquake weather? I don’t really know what that means, but it’s been hot, muggy, and hazy. 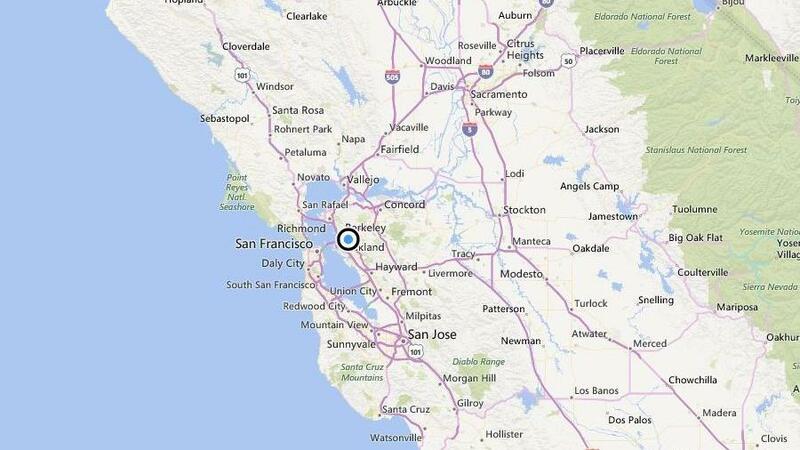 And voilà, this morning we had a 4.0 earthquake centered in the Piedmont area of Oakland. 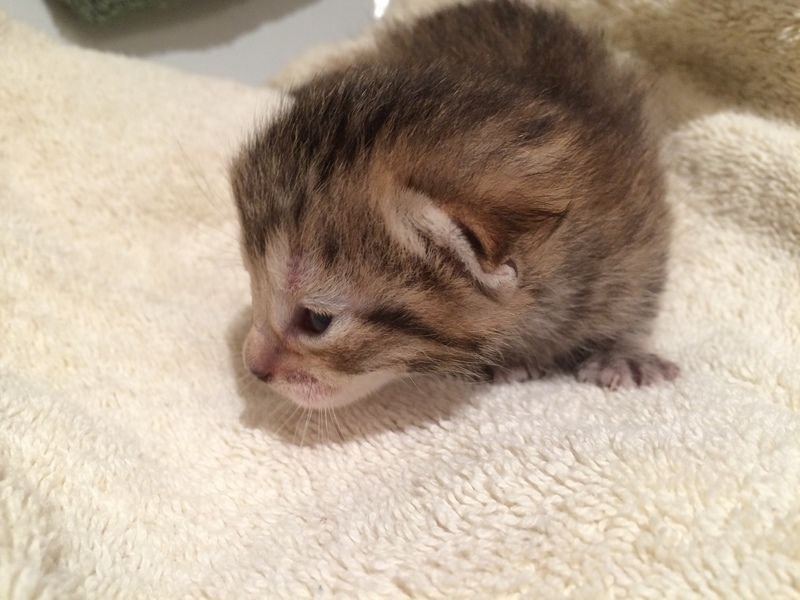 I was awake, up and feeding the foster kitten, Abracadabra. I was in the middle of my open kitchen so I couldn’t really get under a doorway or a desk or table, so I held on and hoped for the best! No damage at our house. The pets weren’t impressed. 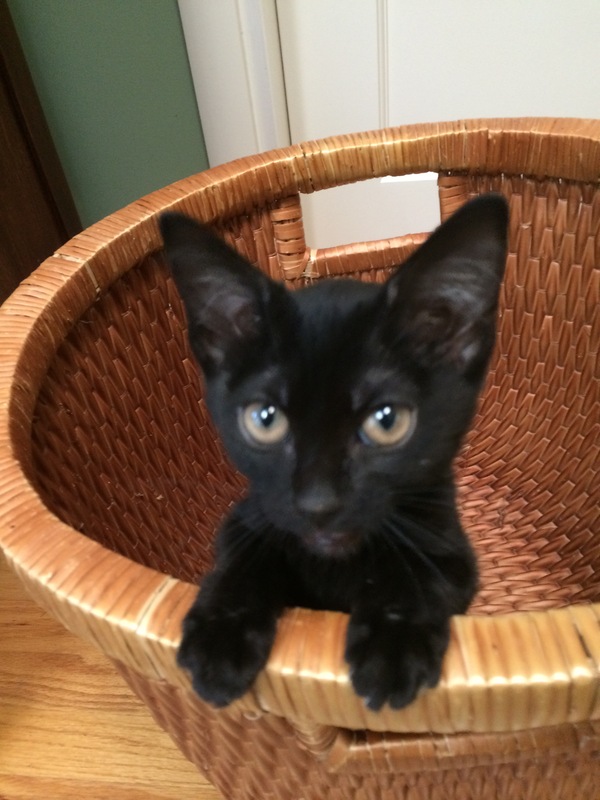 For your entertainment, a little shot of foster kitten Abracadabra. Despite the heat this weekend, I decided to make a trip into San Francisco. I got on BART at 10:51 a.m. and since there was a Giants baseball game in the early afternoon, the cars were already awash in orange and black hats and t-shirts; and it was unbearable in the cars, like being in a sauna with a whole bunch of other people, not all of whom smell so good. 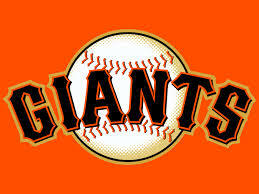 Not necessarily a reflection on Giants fans! I am one! 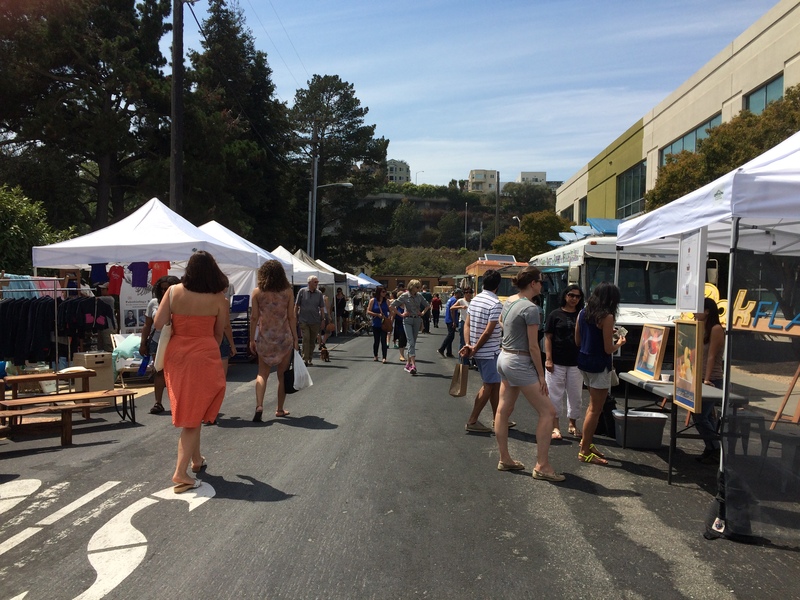 I headed toward the San Francisco Street Food Festival at Pier 70, but it was so hot, and Pier 70 is not really that nice (all hot black asphalt, no shade, and the roasting pigs on spits were way more than this vegan could stand). Instead, I ended up in nearby Esprit Park, with trees and shades (! 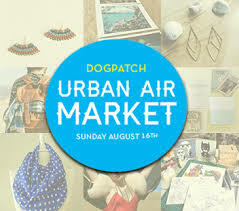 ), and home to the Urban Open Air Street Market, much more my speed. 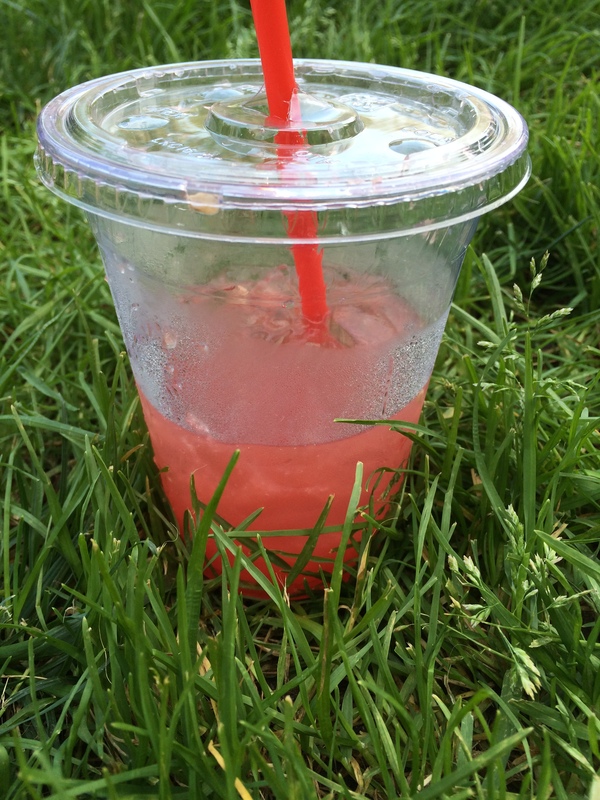 Not necessarily a lot of vegan eats (but no animals on spits, thank goodness), but I had a wonderful cold and refreshing watermelon agua fresca that kept me going for the trip back to the East Bay. 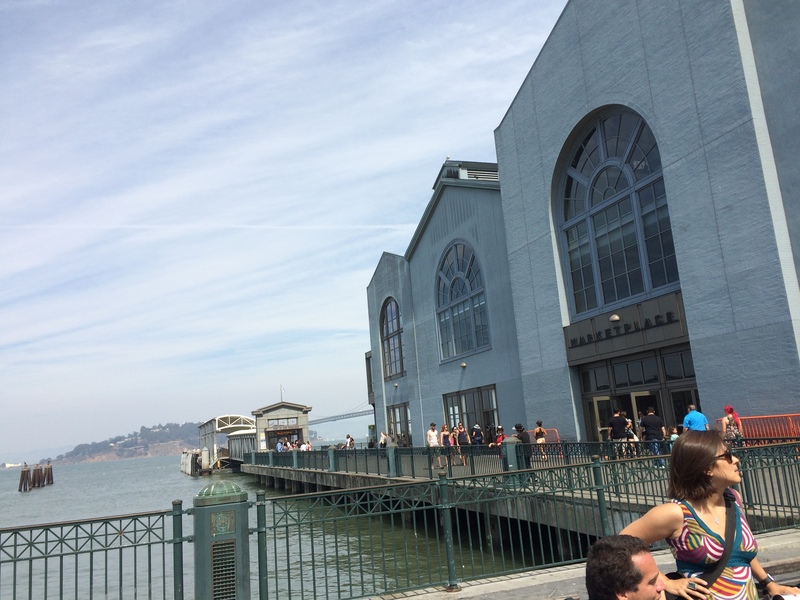 You might be able to see from the shot of the Ferry Building how hazy the air is. The fires north of here are affecting our air quality. It’s really frightening with the fire danger so high, and so many people have been evacuated in the fire zones. And the loss of wildlife and habitat is unthinkable. Back in Oakland, our air conditioner was deployed, one of the few days every summer we feel compelled to use it. Neither of us felt like cooking and it was too hot for anything heavy, so we opted for salad bar dinner (or as my family calls it, big weird salad). 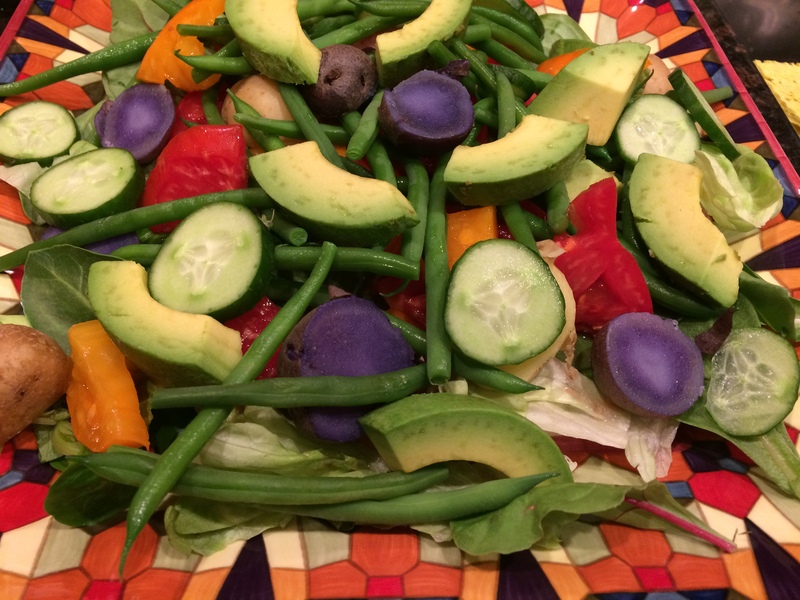 Summer on a plate! Eating on folding trays in front of the television in the air conditioning–childhood memories for sure. 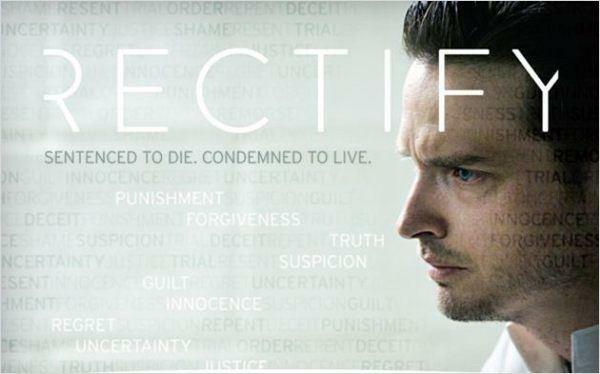 However, as a child I wouldn’t have been watching Rectify, one of the best shows on right now but not 1960s mother-approved fare, for sure. I think we would have been watching The Doris Day Show. 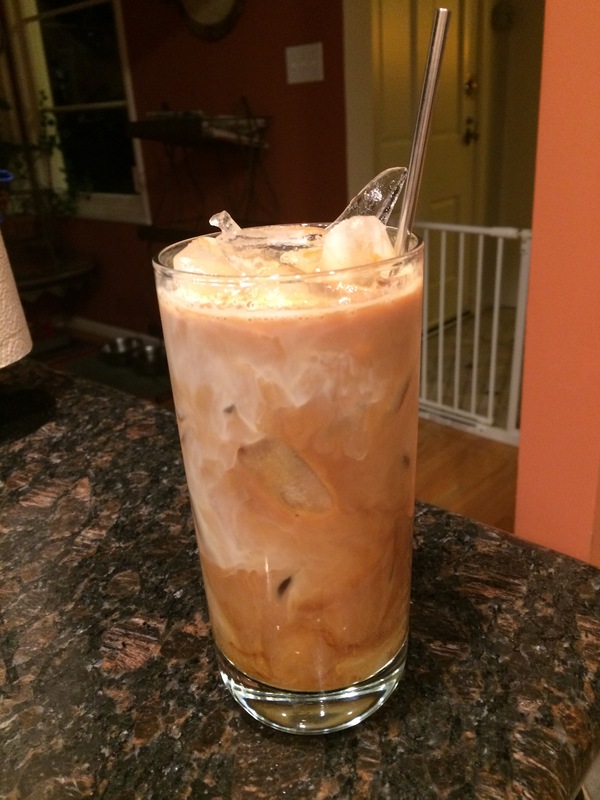 What better way to wind up a hot summer night than with an iced coffee? Decaf of course. 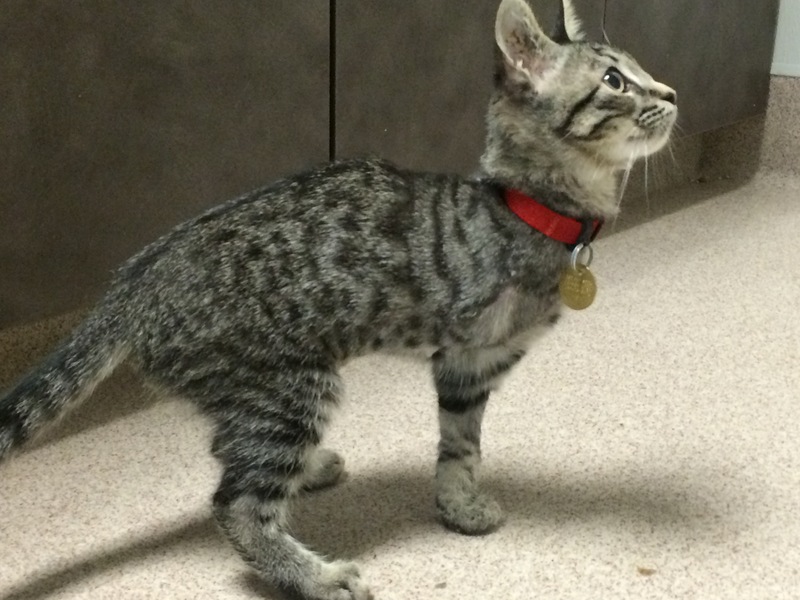 The foster kitten returns to the East Bay SPCA tomorrow to prep for adoptions now that she’s put on some weight. I’ll miss her! But hopefully we will get another one when traveling dies down. 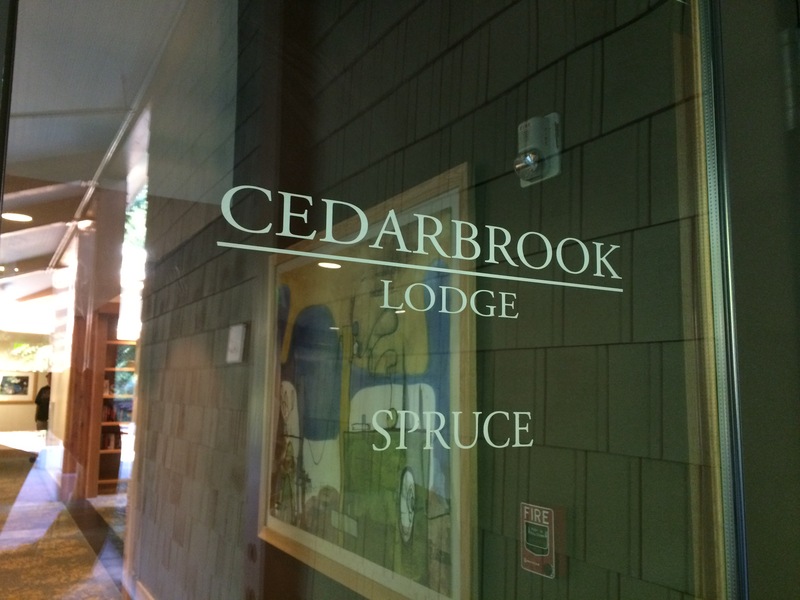 I am off to Seattle in a couple of days; expect some blogging as I start on my doctoral program in humane education with Saybrook University at our term opening from Cedarbrook Lodge! 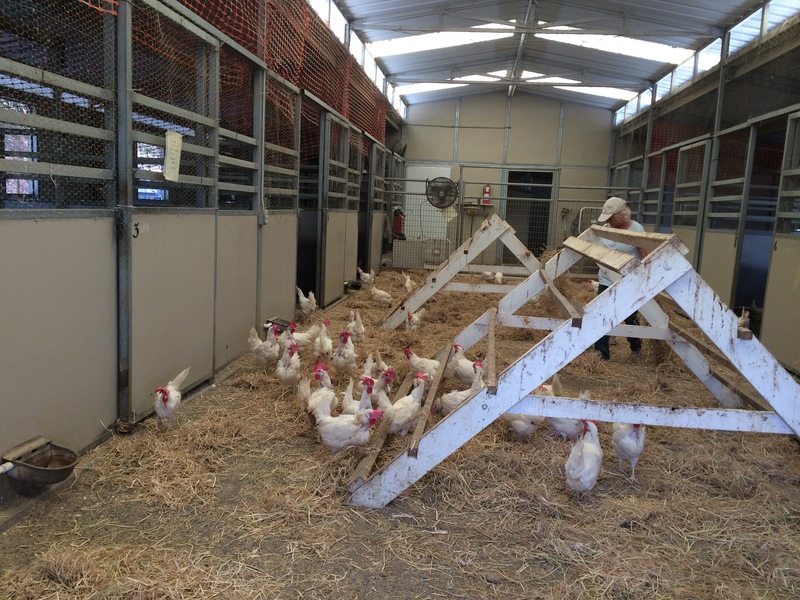 On July 23, 2015 Animal Place liberated 1,500 white Leghorn hens from the agony of battery cages at an egg farm. Dubbed “Liberate Libby” for the poster hen who had her beak mutilated, her feathers battered from rubbing against wire walls, and spent a year with a dozen other hens in a cage, the rescue operation arranged to transport the hens to Animal Place’s Rescue Ranch in Vacaville. 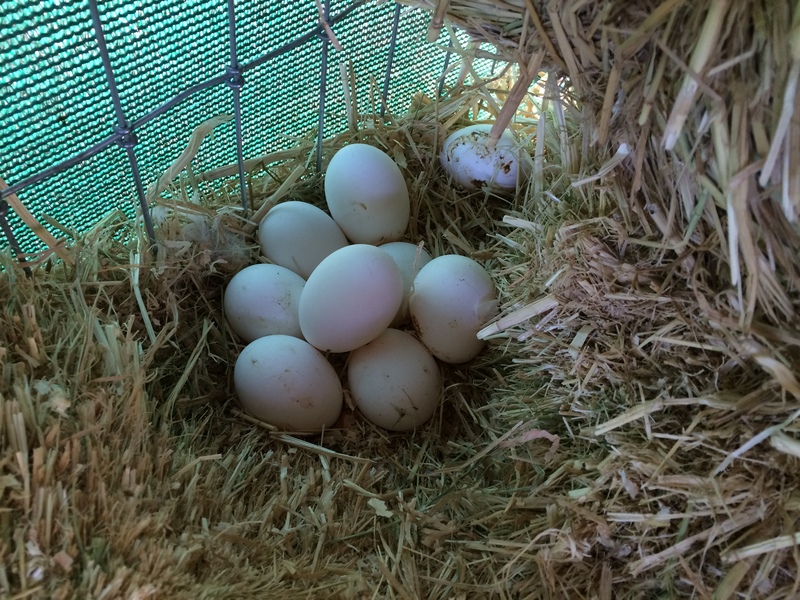 The hens have been undergoing quite a bit of care. 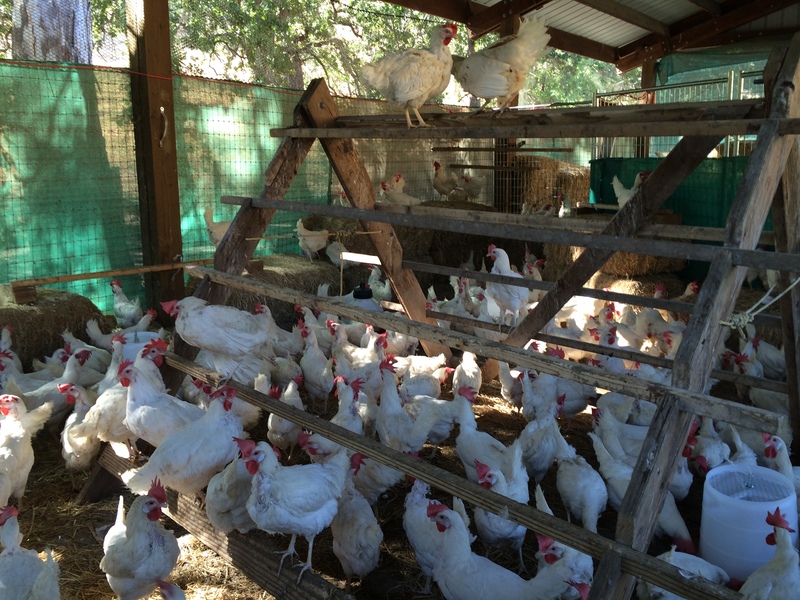 When they first arrive, the hens must be declumped, meaning staff and volunteers spend time when the chickens roost keeping them from piling on top of each other and suffocating. The chickens have never lived outside of their small cage and know no other way of being except crammed together. It takes them a while to figure out they have space to move! They’ve undergone health checks (the hens bred to be layers for industry suffer oft-times fatal consequences of the huge number of eggs they produce and their life spans are seriously shortened). 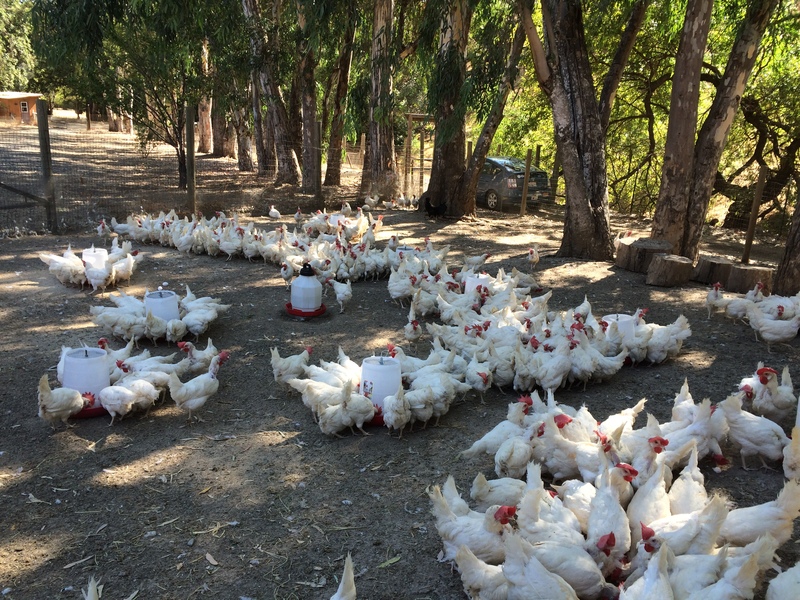 And when their laying days diminish, the majority of white Leghorn hens in California are gassed, their bodies left in landfills. 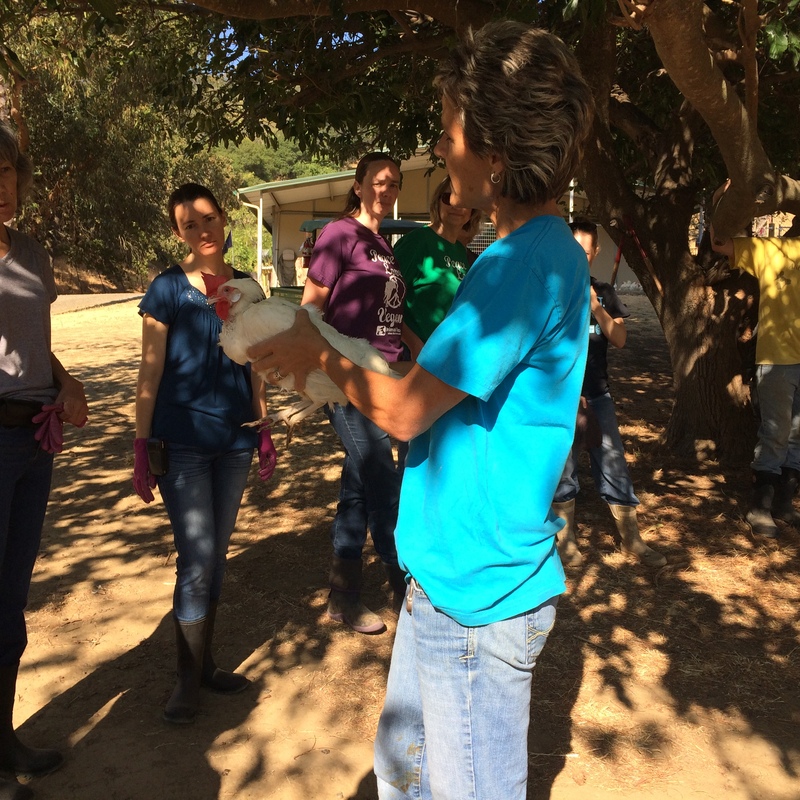 Today, I went with Direct Action Everywhere (DxE) animal activists on a volunteer work day at the Rescue Ranch. 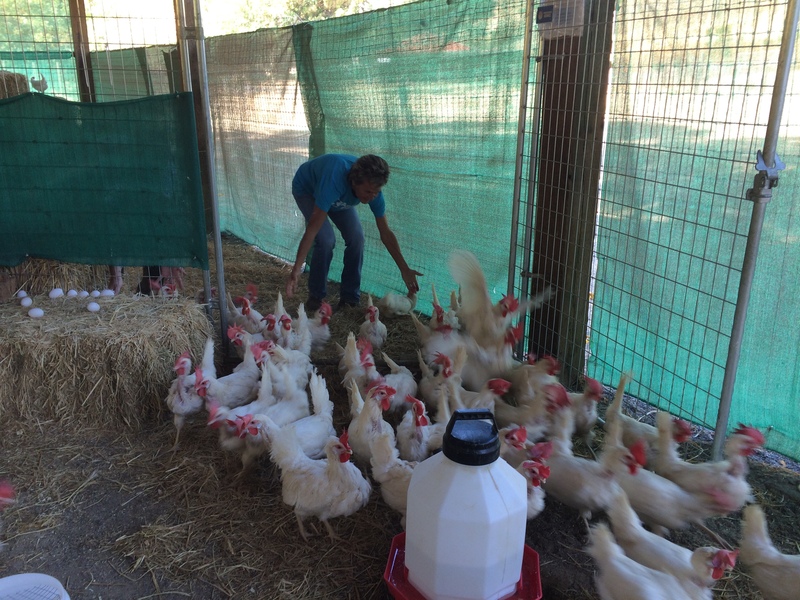 Our mission, to catch one by one each chicken to go through a dosing of Ivermectin, a dewormer, as the last part of their health checking. 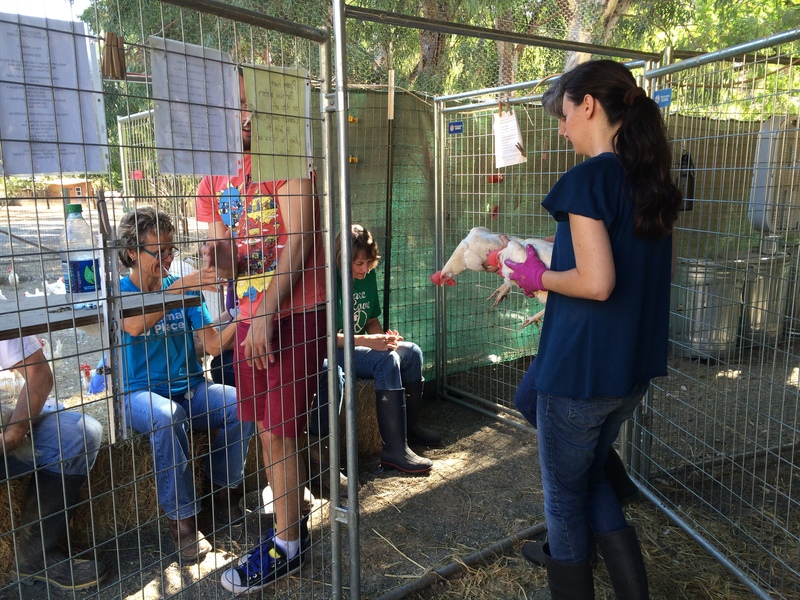 They stay at Rescue Ranch for a total of two months; for the rest of their stay they get to be chickens and also get some socializing. Our first lesson, how to hold a chicken, was provided using Libby herself as our patient demo chicken. We divided into teams and headed to the barns. Another group had assisted Saturday with quite a few of the hens, so our group had about 900 to catch for their treatment. Needless to say, the chickens didn’t really want to be caught and dosed with dewormer. It took a while for some of us to get the hang of it; go slow and be quiet, and work them into corner. DON’T make a lot of noise, chase them around, and generally make an idiot of yourself! Interestingly, each and every one of seemed to be talking softly to the chickens as we caught and held them, calling them Sweetie and telling them we were sorry and that everything would be okay. 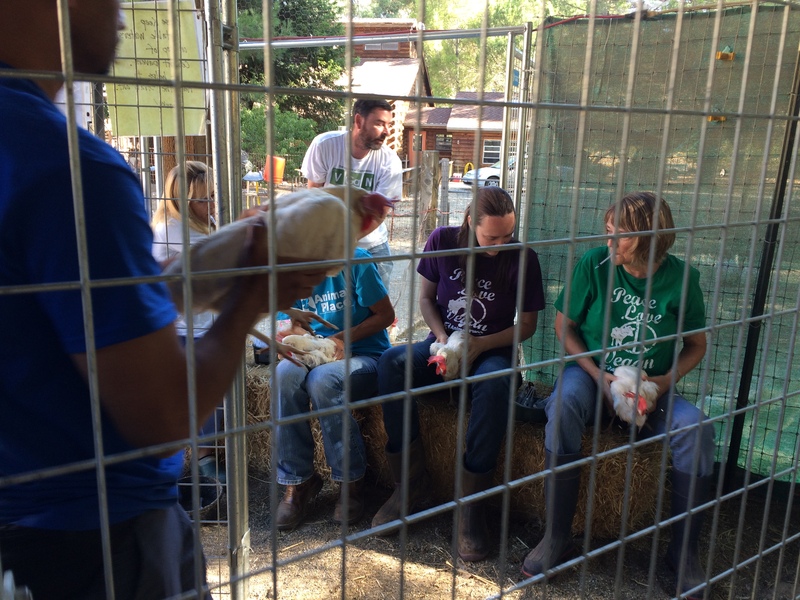 As we caught the chickens, we took them to the dosing line, where 4 experienced handlers were waiting to receive and dose the chickens and send them to the outdoor pen so we could keep track of who had and hadn’t been treated. A fairly efficient assembly line formed. And eventually all of the chickens were on the outside, not the inside. Then it was time to clean the barns, oh joy. 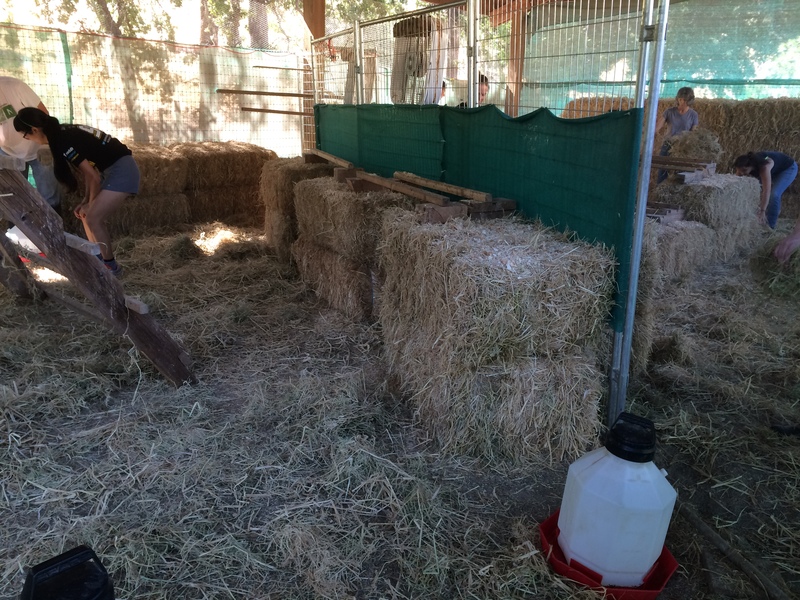 We gathered up eggs (and there were a lot of eggs), raked dirty straw, scraped perches, spread clean straw and topped the hay bales with wood shavings (for absorption and easier cleaning, I presume). It might sound strange, but the eggs are fed back to the chickens. We tossed them on the ground in the outside pen (splat!) and the chickens eagerly ran and started pecking away. The nutrients they lost are thus returned to their depleted bodies. I was surprised to hear music playing in the biggest of the barns; apparently it keeps the raccoons from stealing in and killing the chickens. Raccoons don’t like classic rock I guess! There were also much appreciated fans blowing in the big barn. It gets hot in Vacaville. 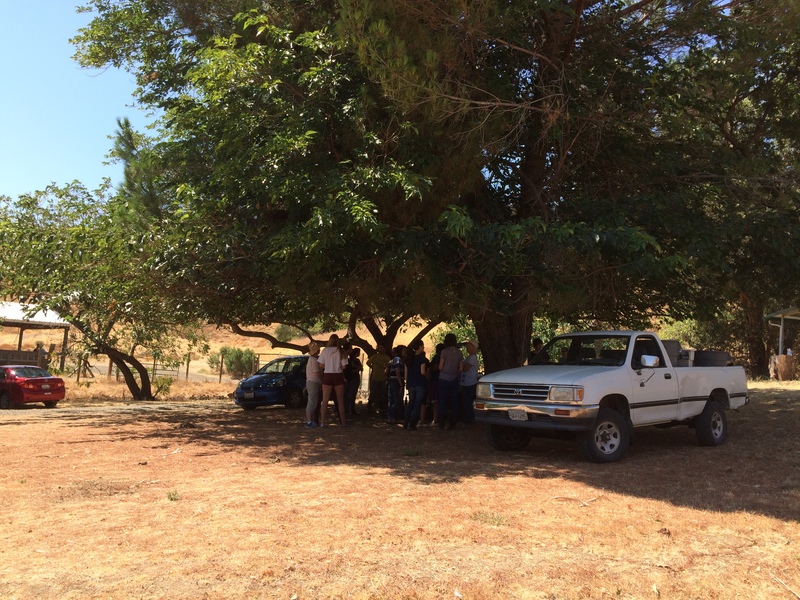 As a gesture of thanks, Animal Place provided us with drinks and snacks in the shade of a lovely tree. 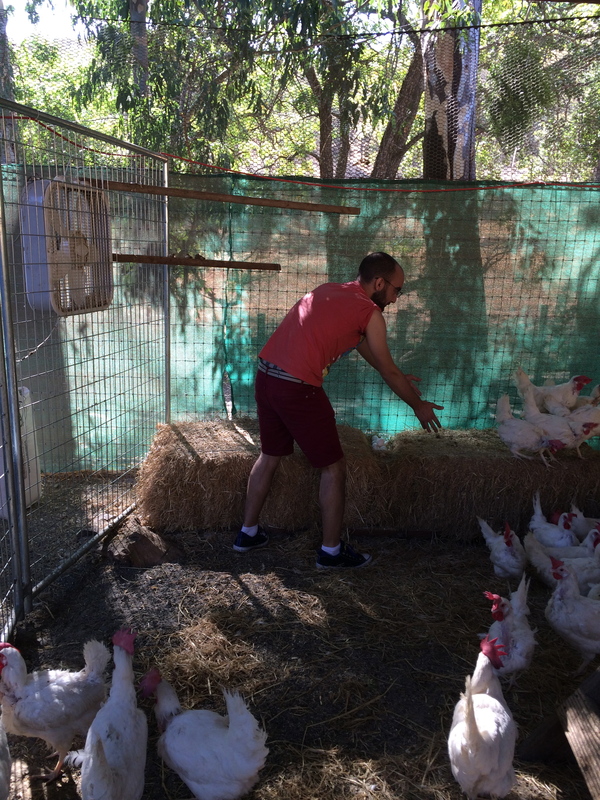 It was hard work, but great to get to know some feisty chickens and spend some time with my new DxE friends. The California drought is quite apparent in this part of California; the hills are dry and the fire danger is high. 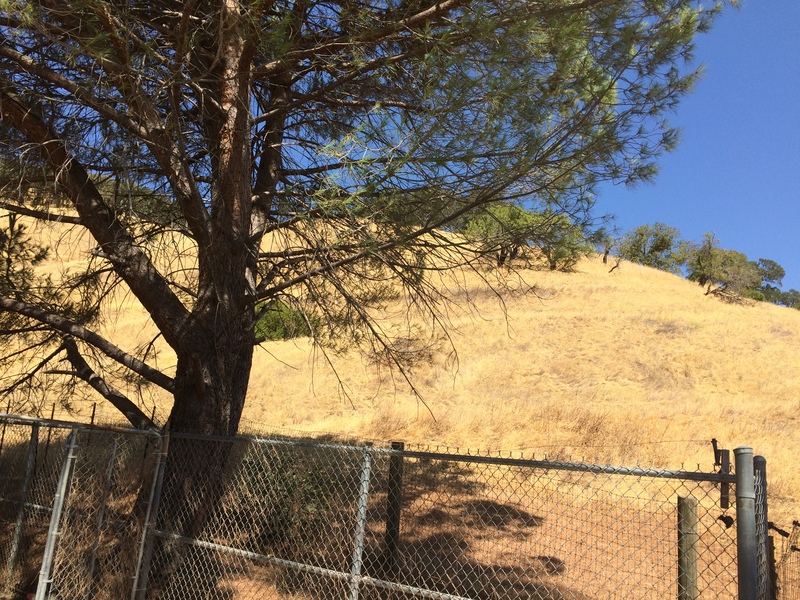 It can be hard to believe the drought is as bad as it is living in the Bay Area, but the land is suffering. Thank you to the DxE organizers for this event. 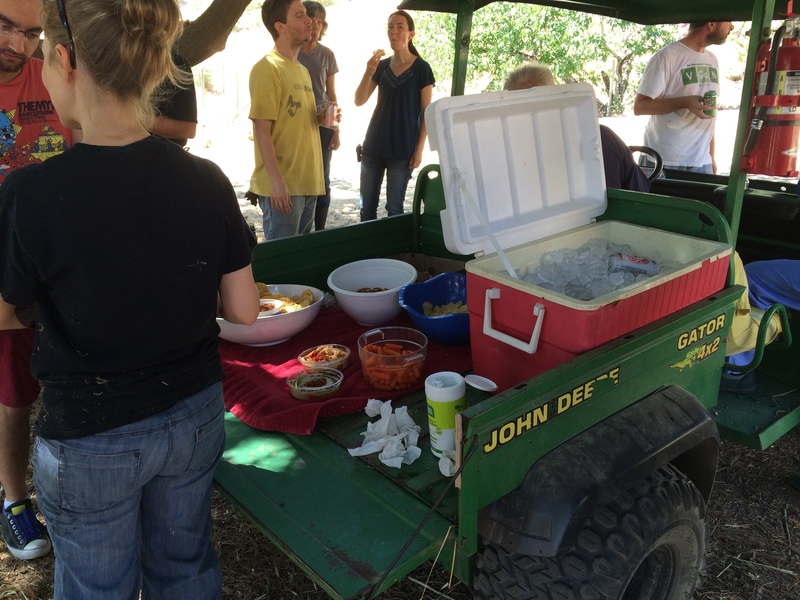 It was my first work day at an animal sanctuary and it was hot but fun. Looking forward to the next one! I hope to eventually get to spend some time with goats at one of these work days. 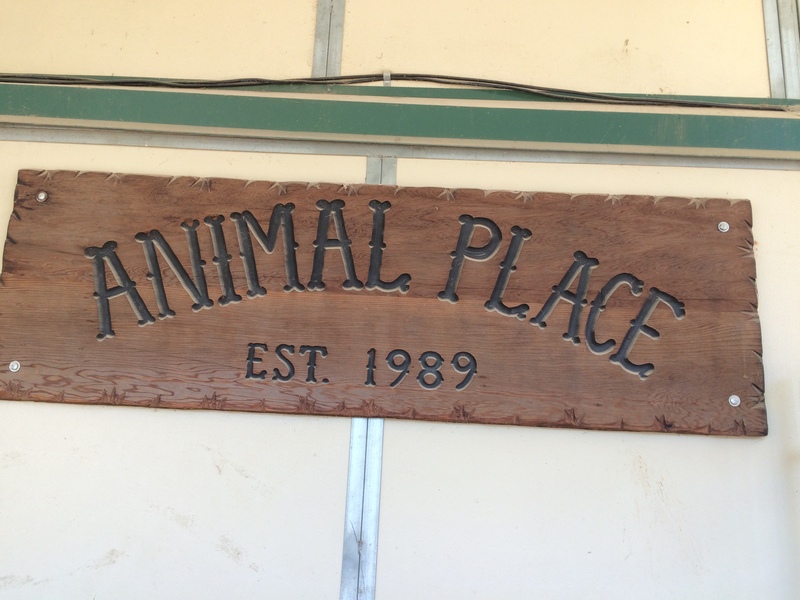 And thank you so much for the hospitality of the folks at Animal Place and for the amazing work they do for the animals. Happy International Cat Day! 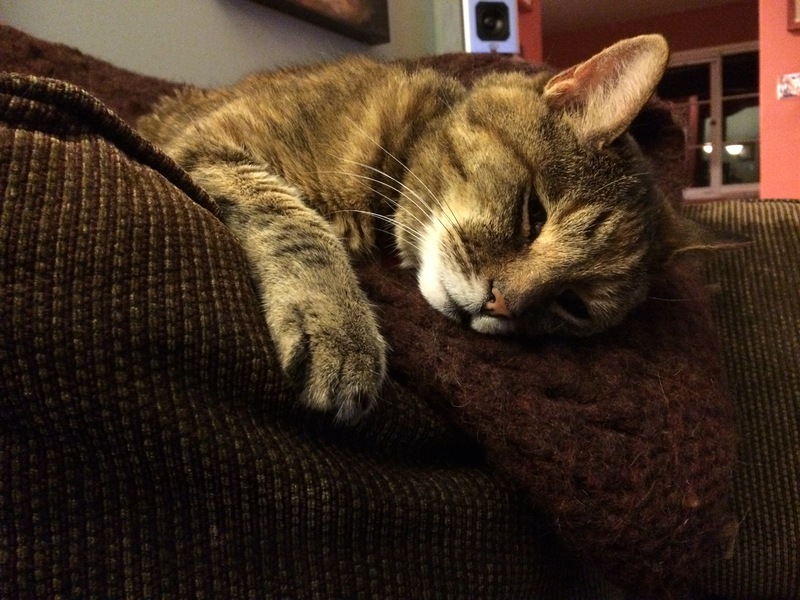 I don’t know who decides these things, and it’s always cat day in my world, but today we celebrate cats. 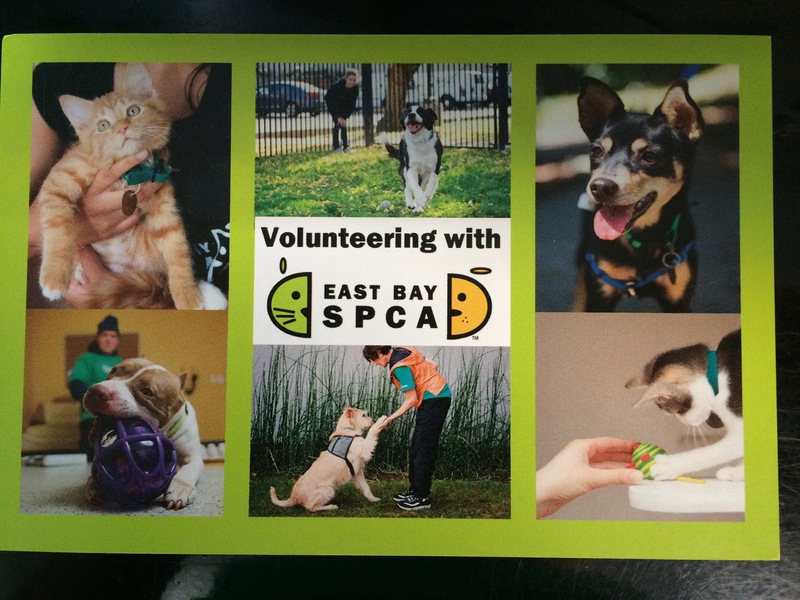 I have been volunteering at the East Bay SPCA in Oakland, California since 2009. It was a time of much personal turmoil. My mother had just passed away after a battle with cancer; I had been spending much of my time up in Sacramento with her and I suddenly felt like I had way too much time on my hands when she was gone. I had been thinking of volunteering for a while, either in a library setting or doing something with animals. 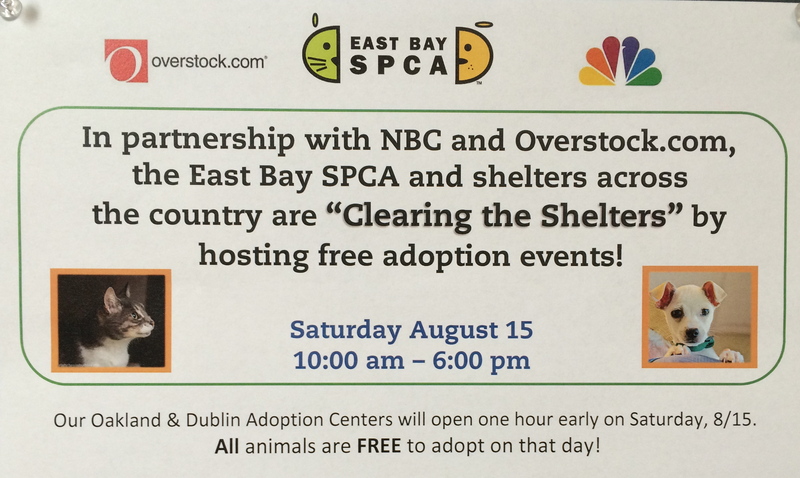 We were at the yearly Solano Stroll street fair in Berkeley and a friendly volunteer at the East Bay SPCA’s booth handed me a flyer; it seemed like a sign. It’s been almost 6 years ago that I went to a volunteer orientation and it’s the best decision I ever made! 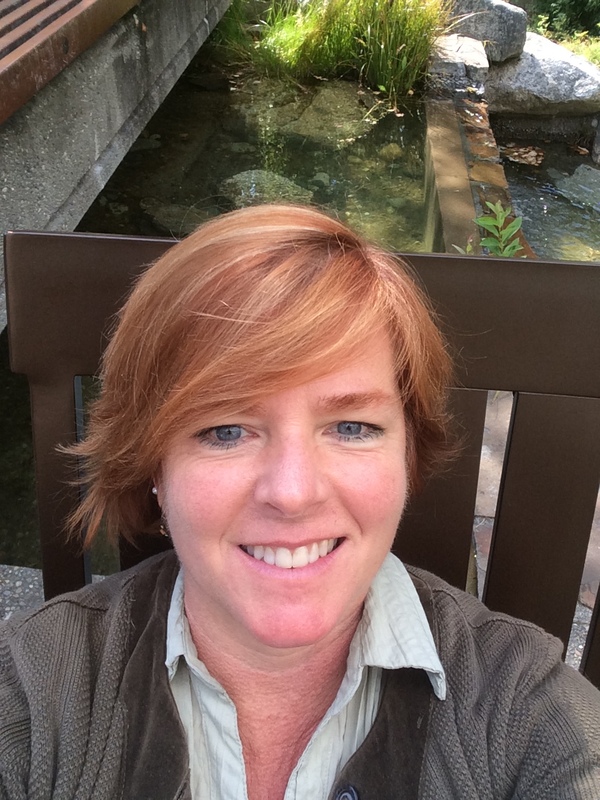 I started as a cat socializer, and over time have trained as a canine companion (dog walker), adoption counselor, volunteer mentor, lead off-site event volunteer, co-taught the cat volunteer training, and am now a customer care volunteer. 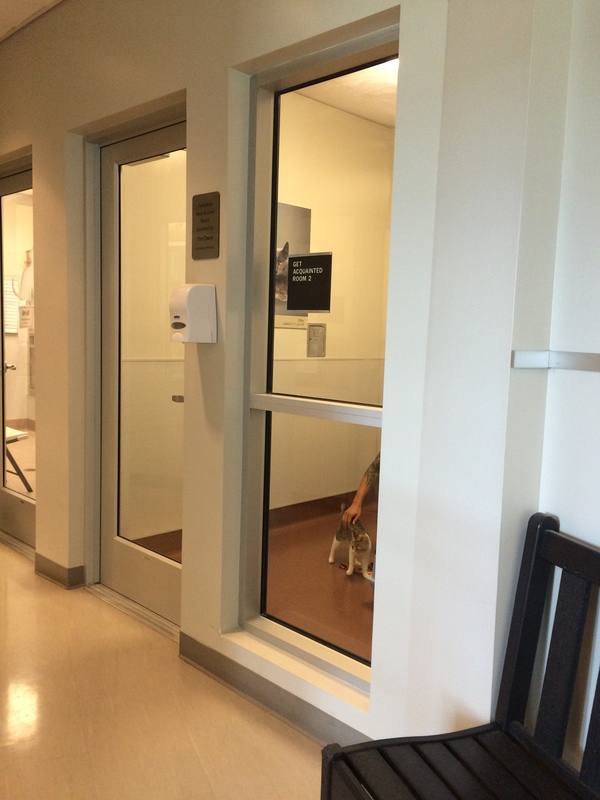 I spend my Saturdays helping people coming in to find their match (both cats and dogs) and facilitate the adoption process. And when it’s slow, I still socialize with the kitties and pups. 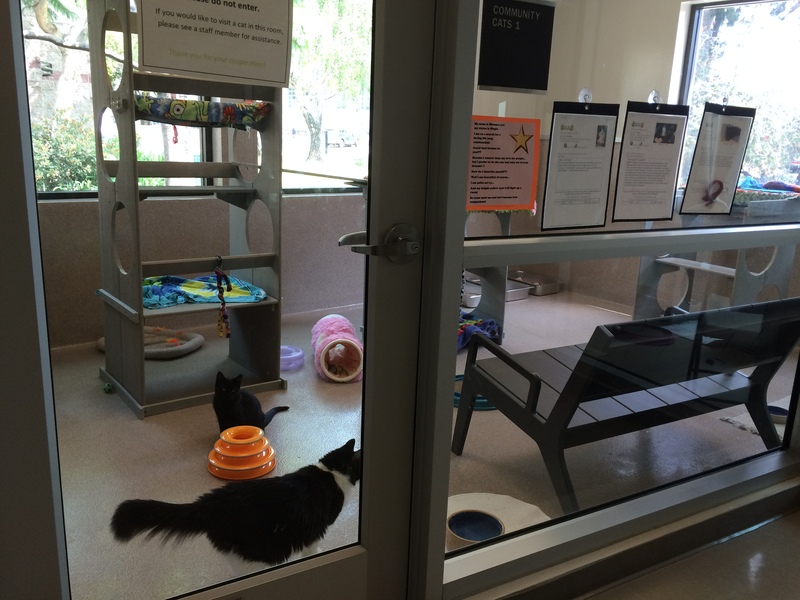 Today, for International Cat Day, I’m taking a look at a typical Saturday with the cats at the shelter. 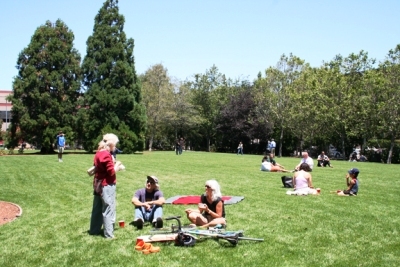 The East Bay SPCA was founded in 1874 and as an independent nonprofit is not affiliated with any other SPCA. 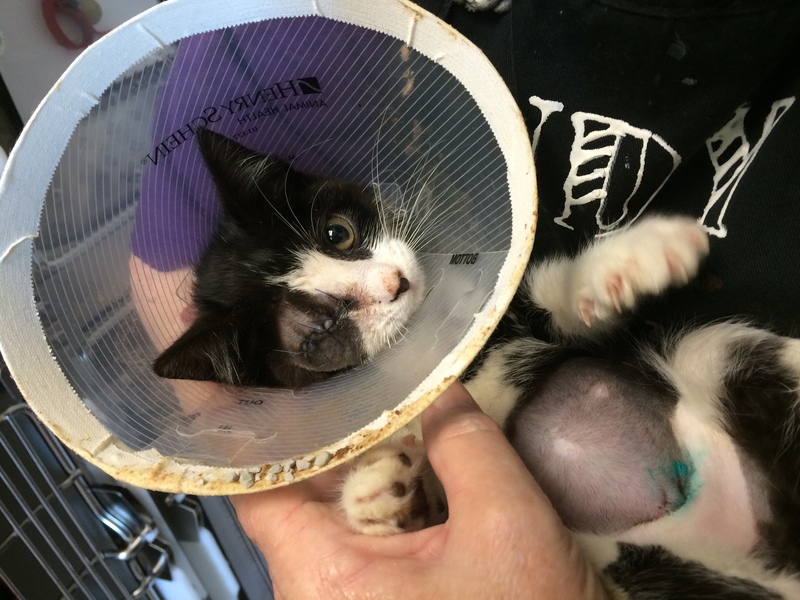 With adoption centers, education centers, spay/neuter centers in both Oakland and Dublin and a full-service veterinary clinic in Oakland, the EBSPCA currently utilizes the services of about 375 volunteers. 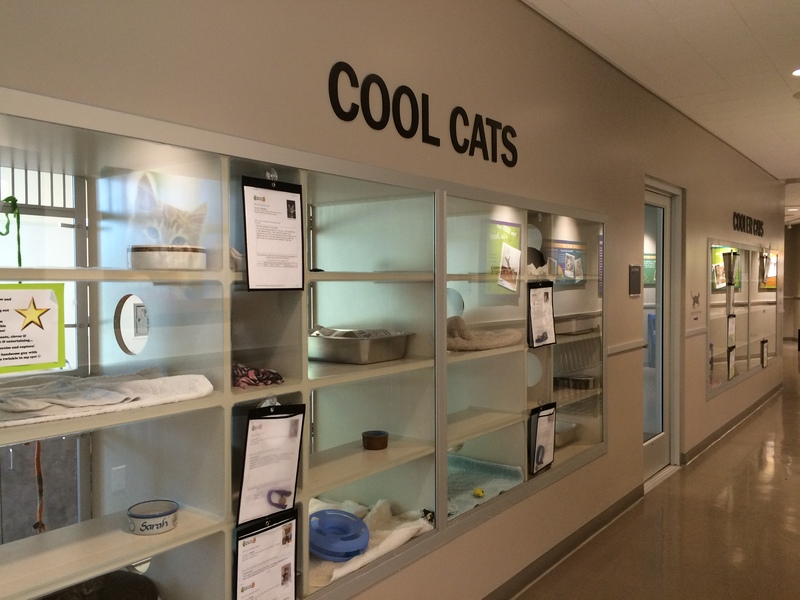 Today when I arrived at the Oakland adoption center, there were 31 cats available for adoption and many more in the back holding area awaiting behavior and/or health checks and other procedures before being moved up to one of the two the adoption centers. 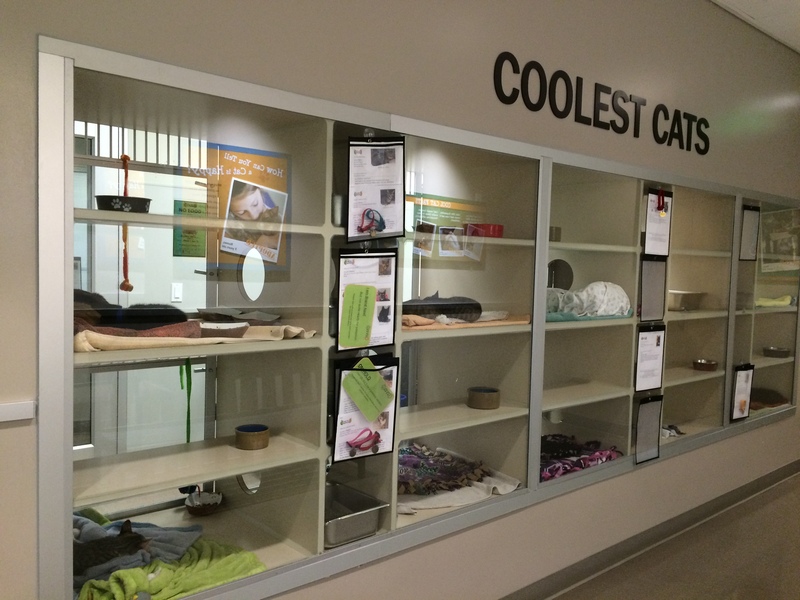 The cat adoption area is bright and cheerful, having undergone a remodeling in the last couple of years. 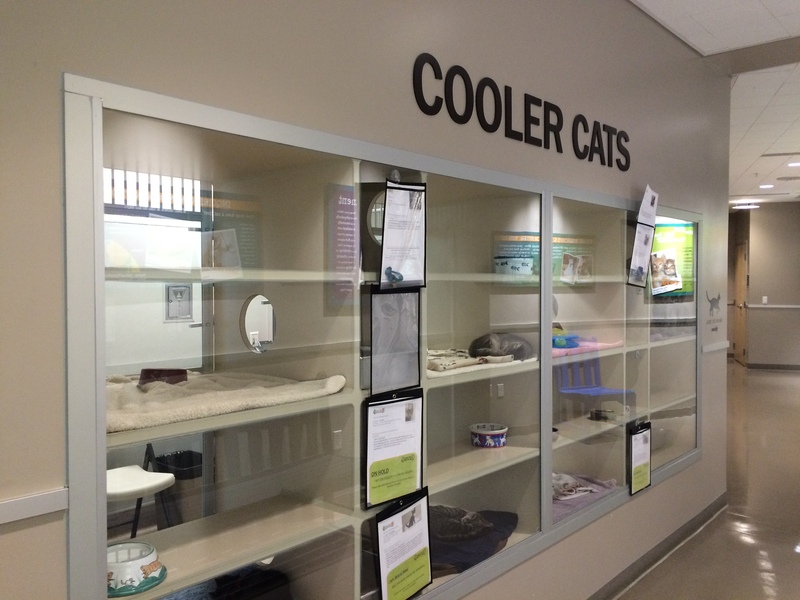 There is a hallway showcasing individual cats, currently mostly kittens, as well as 3 colony rooms where cats who get along live in groups, plus 2 “get acquainted” rooms for potential adopters to meet cats up close and personal. 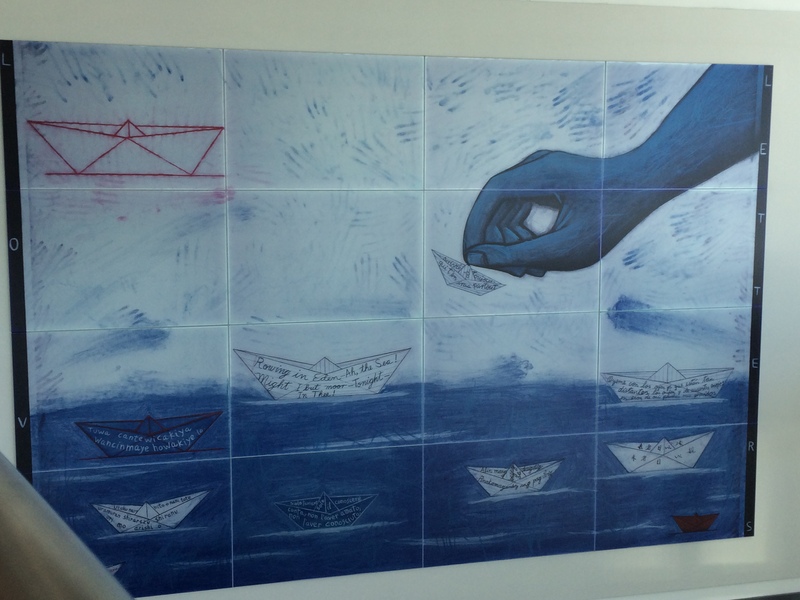 I first visited the holding area, off-limits to the public, to meet the new arrivals. 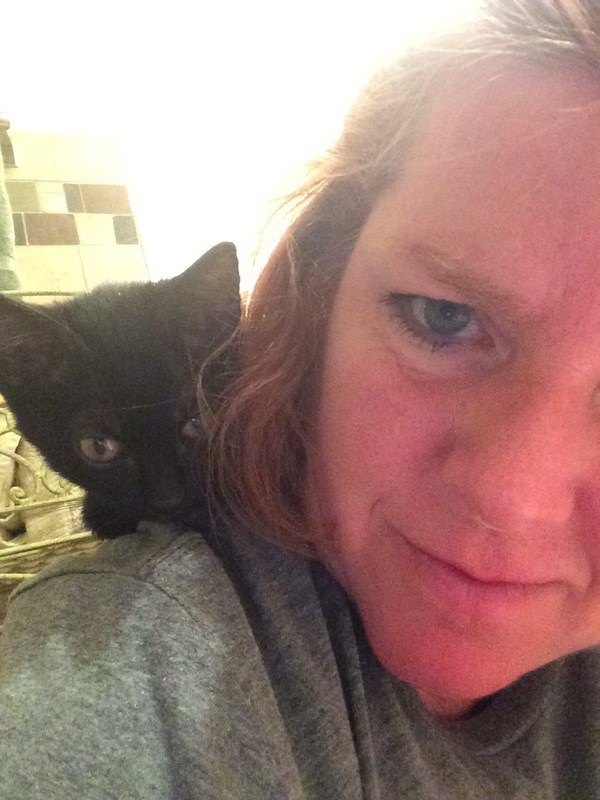 My friend Judy volunteers in the back and always directs me to the cutest newbie of the day. 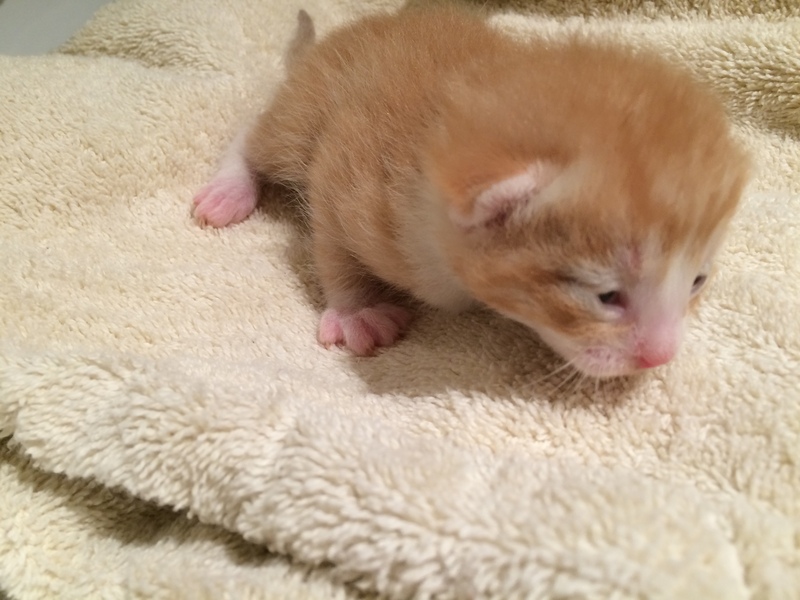 It being kitten season, there were many adorable faces! 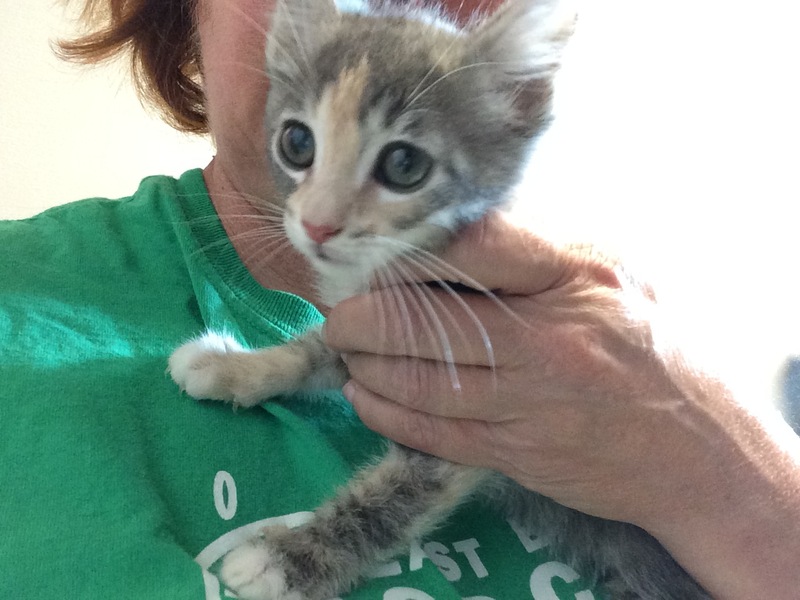 Tiny but vocal Francine, 8 weeks old and underweight, really wanted attention. Her siblings Fanny and French Fry, in the next cage, were a little quieter but just as cute. Pretty Iris, recovering from the double whammy of spay surgery and having an infected eye removed, was still happy to have a tummy run and a neck scritch where the cone was bugging her. Up in the adoption center, spunky kitten Antelope was not slowed down by having 3 legs instead of 4, eagerly exploring and asking for head rubs. Of course, it’s not all kittens. Kittens are adopted pretty quickly. 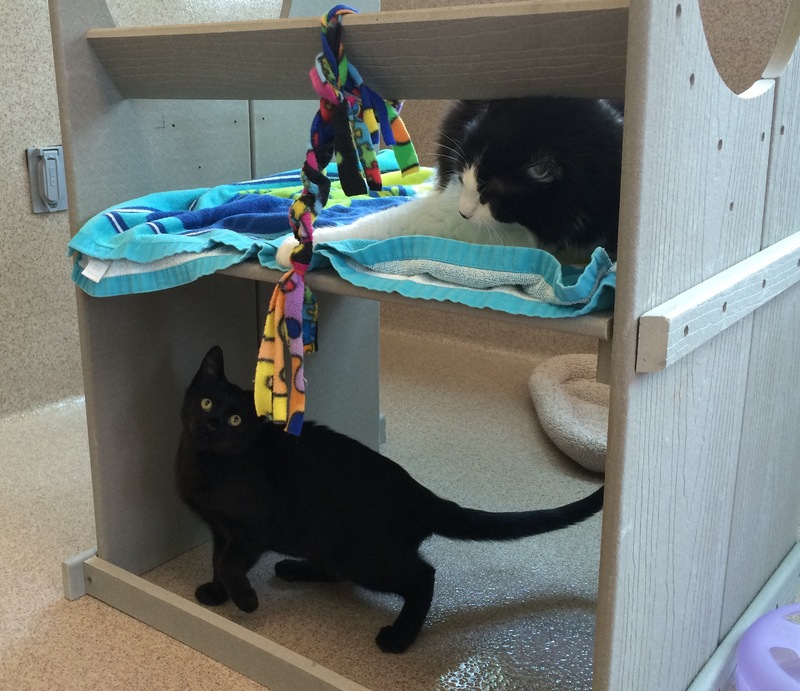 It’s the older cats who often wait at the shelter for longer to find homes. And sadly, black cats and black and white cats wait the longest. Even with kittens, the black kittens spend a little longer than the others. Black cats are not bad luck; give them a chance! Here is 8-year old Bloomer exercising patience with roommate 4-month old Ricky Bobby in one of the colonies. The oldest cat I visited today was 10 year old Norwegian Forest cat Tikka. 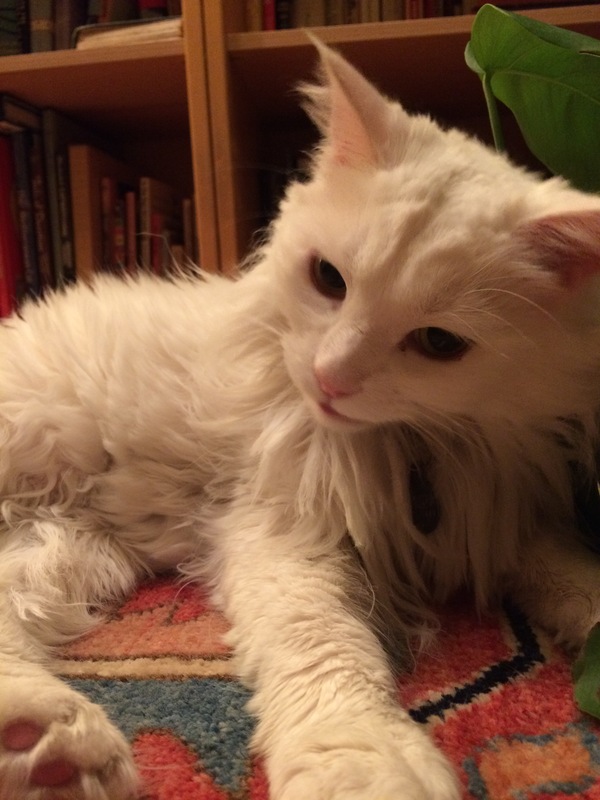 She had lived with her family since she was a kitten but she didn’t get along with a new cat they brought into the home so she was surrendered to the shelter for adoption. 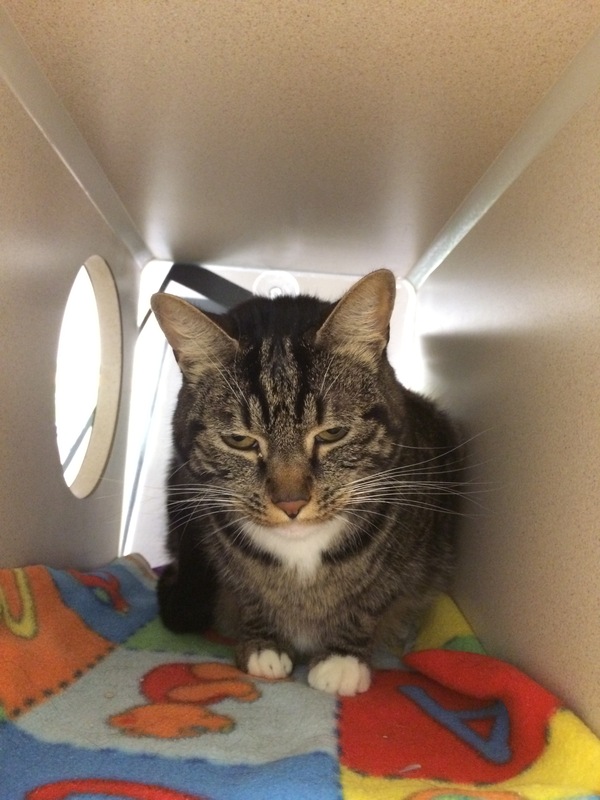 A little shy but sweet and oh so beautiful, she needs a quiet home where she can be the only princess cat. 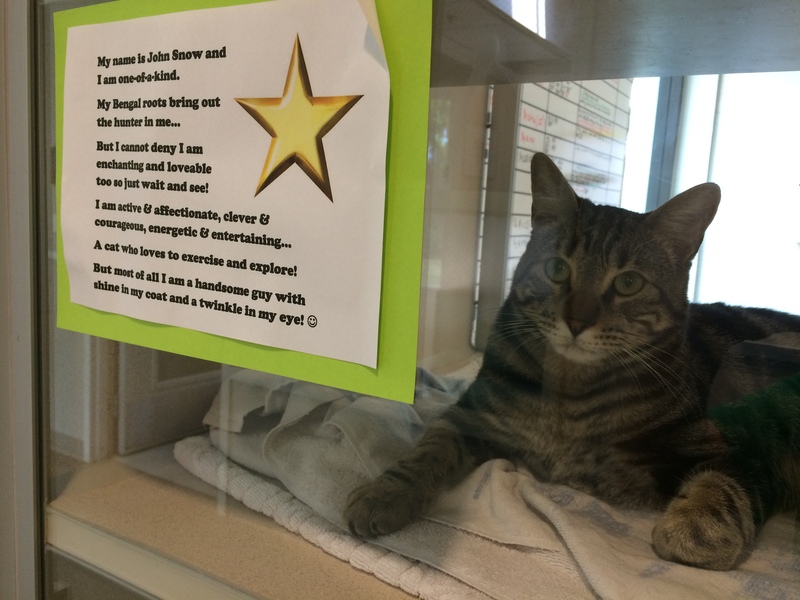 John Snow has been at the shelter since April. 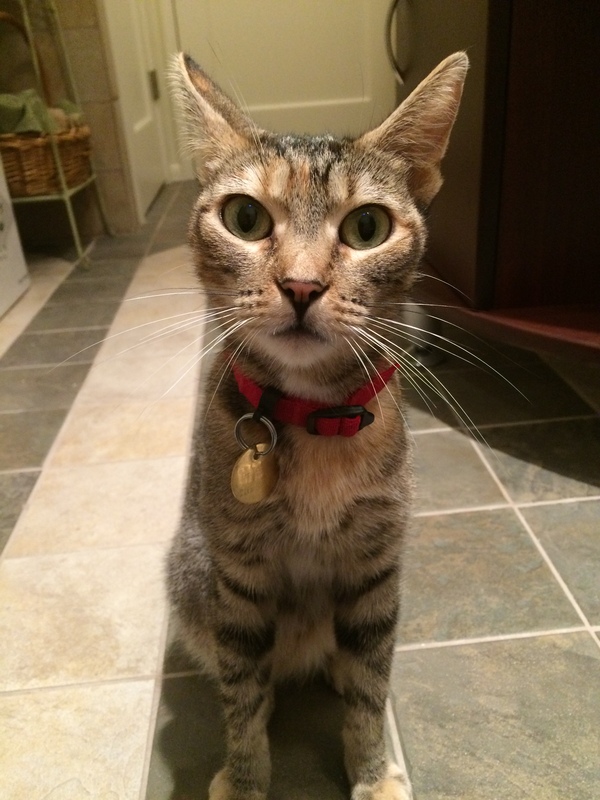 He’s quite the charming gentleman, and his Bengal roots mean he is active and playful. 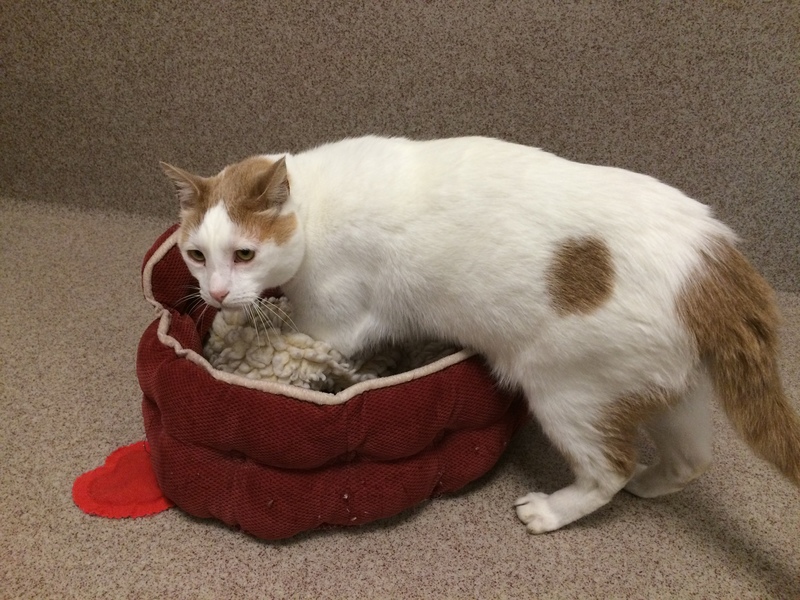 He was adopted during his stay at the shelter but returned because like Tikka, he needs to be an only cat. 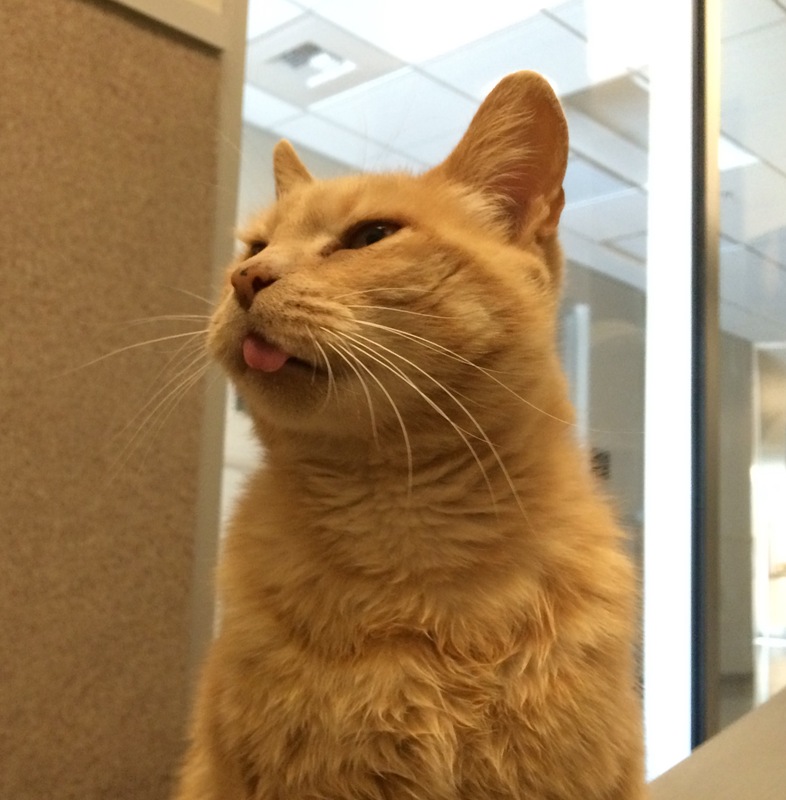 Six-year old Ma’am, brought in as a stray, doesn’t think much of my taking her picture to become a media star. When I left after my 4-hour shift, 3 kittens had been adopted, 3 had been placed on hold, and 2 adult kitties, Poptart (surrendered because of a new baby in the home) and Aspen (surrendered because the landlord was asking for an increased pet deposit) were in the process of being adopted. Yay Poptart and Aspen! It was dinner time, so everyone was happy. 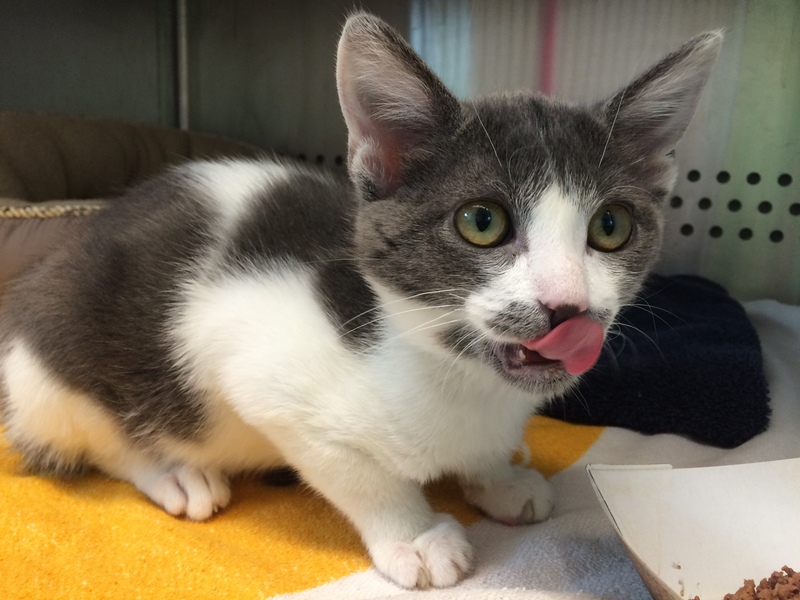 Here is Sweet Pea enjoying her meal. If any of these sweet faces grab at your heartstrings, next Saturday, August 15, is the Clear the Shelters event, with help from Overstock.com and NBC, with free adoptions from 10-4. Come on by! 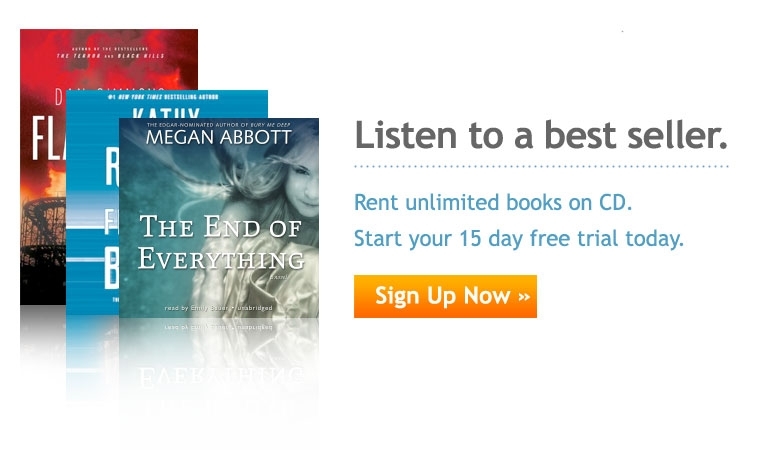 I often listen to audiobooks (thanks to SimplyAudiobooks) in the car on my commute. One of my most recent pleasant surprises was Juliet in August, by Dianne Warren, read by Cassandra Campbell. I’m a Kent Haruf fan; I love his straightforward prose and moving portrayals of intertwining lives in small town Colorado. This had a similar feel, but set in Saskatchewan, with rich, overlapping stories and a real sense of the difficulties of everyday life. But I am between books right now, and am on a streak of podcast listening while I look for my next engrossing book to listen to. 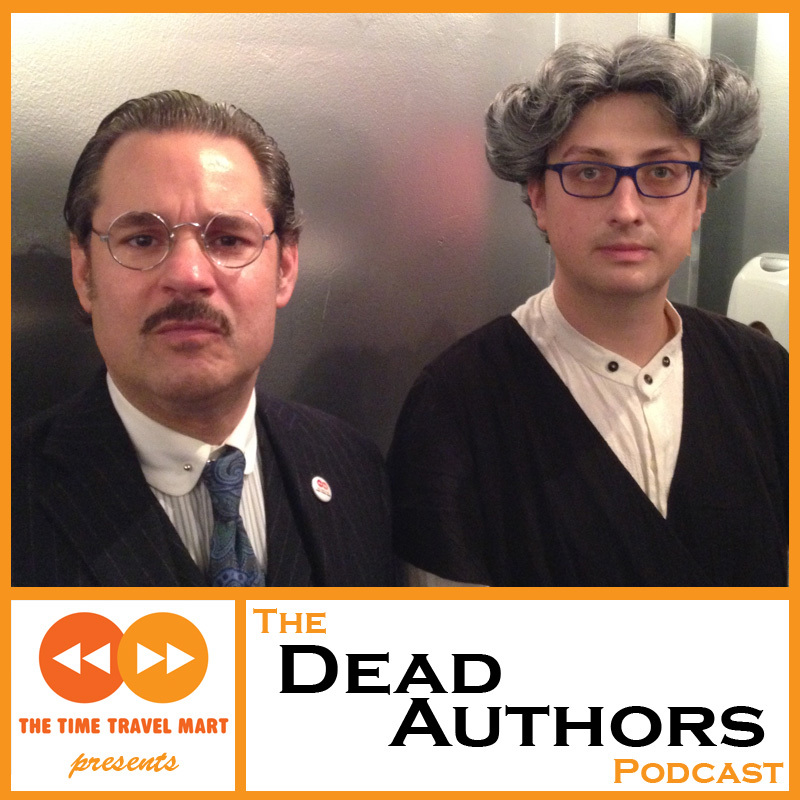 I revisited a particular favorite this morning, The Dead Authors Podcast. It’s a hilarious live podcast with host time-traveling H.G. Wells (Paul F. Thompkins) in conversation with a variety of writers brought back from the past in his time machine. 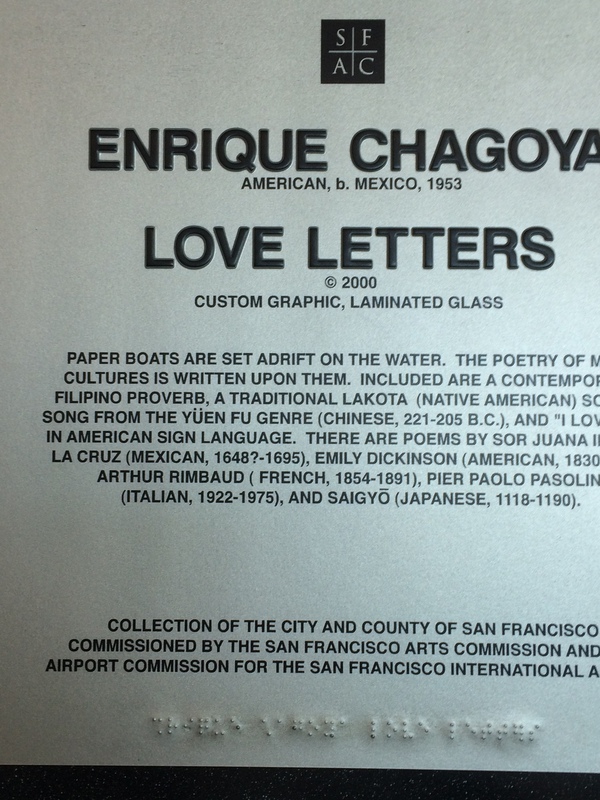 It is connected with 826 National, a non-profit that includes the tutoring centers such as 826 Valencia in San Francisco. Even when I am not familiar with the writers, I have a good time. The most recent was with Lucy Maud Montgomery (Ryan Beil), author of the Anne of Green Gables books. Spoiler alert–she really hated Anne and wanted to kill her off. This got me thinking about some of my other favorite podcasts. Of course, I’ve gone through listening fads. 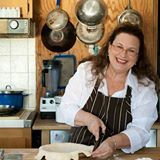 For a while I didn’t listen to anything but Animal Radio; then it was KCRW’s Good Food with Evan Kleiman. But I’ve moved on from those. 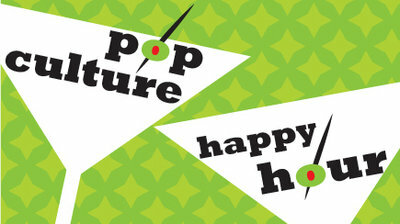 Pop Culture Happy Hour, hosted by Linda Holmes, Glen Weldon, Stephen Thompson and a rotating list of guest hosts, is the podcast from Monkey See, NPR’s blog for pop culture news and analysis. Not only is it entertaining, but I feel less like I live under a rock when I listen. I’ve gotten great book, movie and music tips. Futility Closet: “an idler’s miscellany of compendious amusements” hosted by Greg and Sharon Ross, “is a collection of entertaining curiosities in history, literature, language, art, philosophy, and mathematics, designed to help you waste time as enjoyably as possible.” And the lateral thinking puzzles are addictive. Mystery Show, where Starlee Kine solves mysteries. Listen to case #3: Belt Buckle. 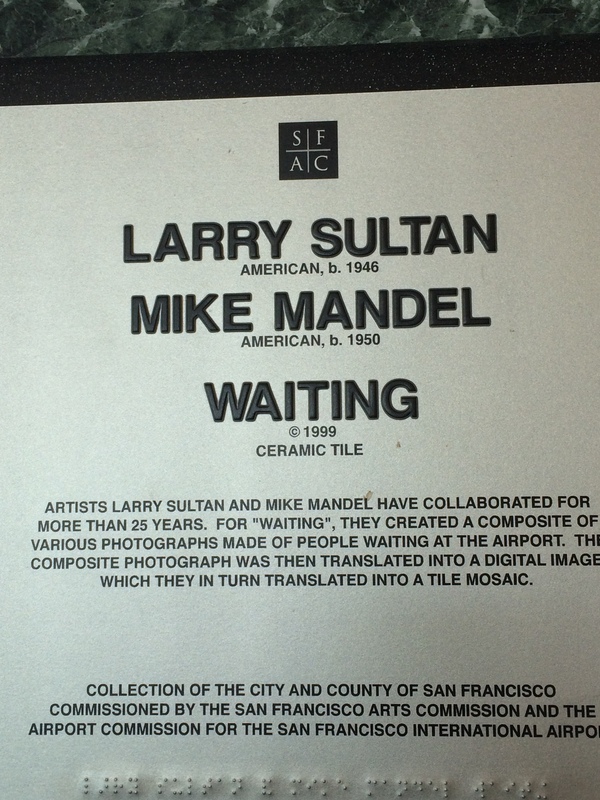 This American Life, the classic that I probably don’t need to describe, with host Ira Glass. 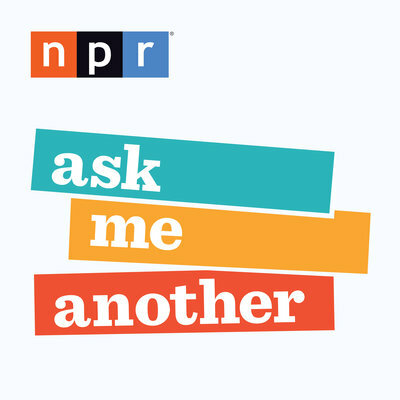 Ask Me Another, also from NPR (yes, I’m an NPR kinda gal), probably the funniest quiz show, like being at a pub quiz with really fun people. Hosted by Ophira Eisenberg; I’m especially fond of house musician Jonathan Coulton and the musical quizzes. 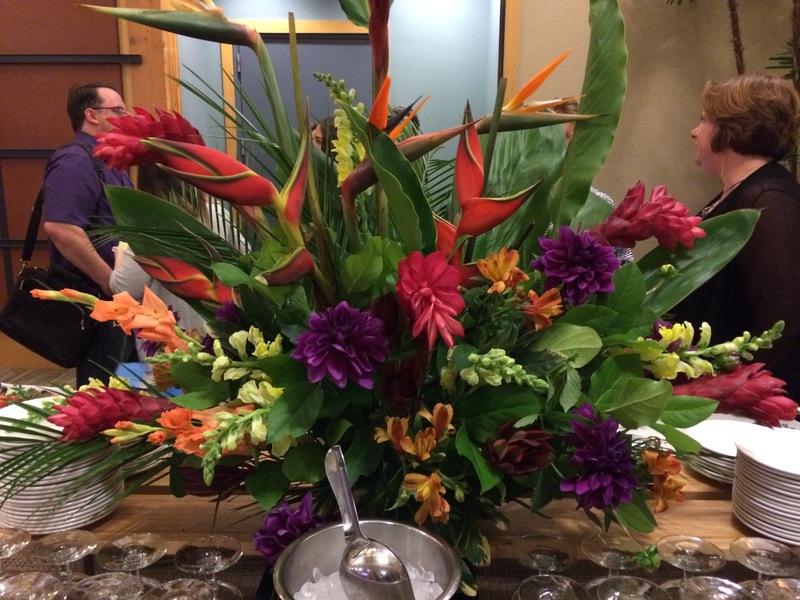 America’s Test Kitchen, with host Christopher Kimball. 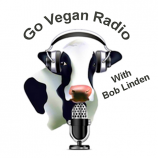 I sometimes fast forward through the meat cookery since I’m transitioning from vegetarian to vegan, but I still love to listen to the why’s behind the answers to cooking questions. Go Vegan Radio is a new one for me so I can’t speak intelligently to its content, but it has been on the air for 13 years and bills itself as “the radio show about everything – food, health, environment, peace, politics, social justice – and broadcasts the solutions to all the problems about which other talk shows merely complain – war, violence, disease, world hunger, poverty, climate change, deforestation, resource depletion, water shortage, energy crises, habitat destruction, animal suffering.” Sounds like me! 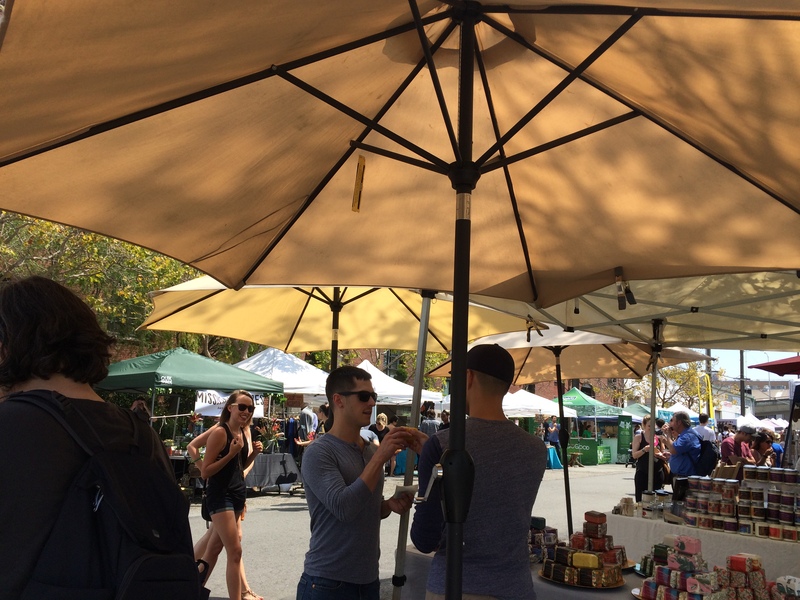 Main Street Vegan: I first heard Victoria Moran speak at the 2015 Conscious Eating Conference in Berkeley. I was utterly charmed by her and want to be her! She’s written many books and is an incredible speaker. If you ever have a chance to go to one of her talks, do yourself and favor and go! 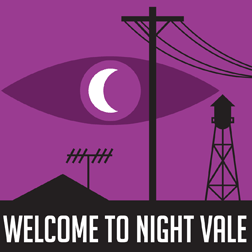 Welcome to Night Vale, maybe an acquired taste. 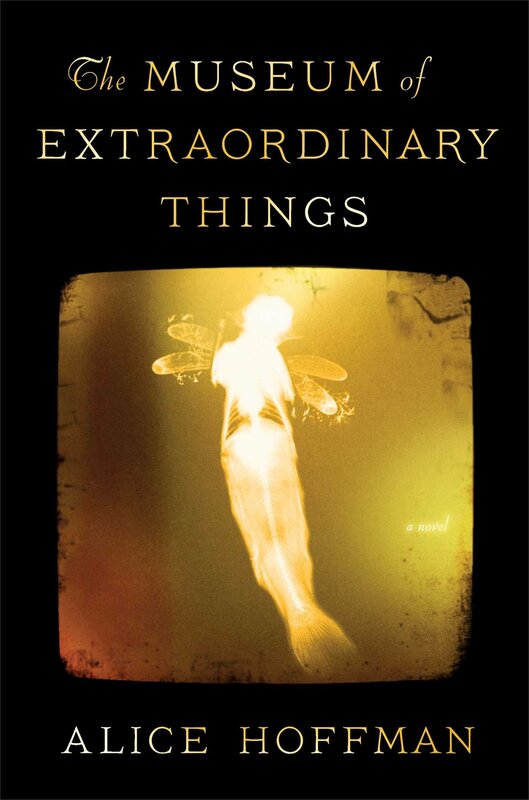 I’ve heard it described as Garrison Keillor meets Stephen King. Apt description. I went with a friend to one of their live shows when they were in Oakland and I enjoyed it almost more than the podcast. I have to be in the right mood for this one! I could go on and on, but I won’t. I can’t keep up even with these. Now, any recommendations for my next audiobook? Jet lag. Not fun. Why is it so exhausting waiting around airports for delayed flights and then sitting strapped into an airplane seat? I was really glad to be home to see the pets, but I miss Scandinavia! Here are the critters that got me home: Sara, 17 year old brown tabby; Misty, 5 year old Turkish Angora; Einstein, 5 year old terrier mix. All rescues, of course! 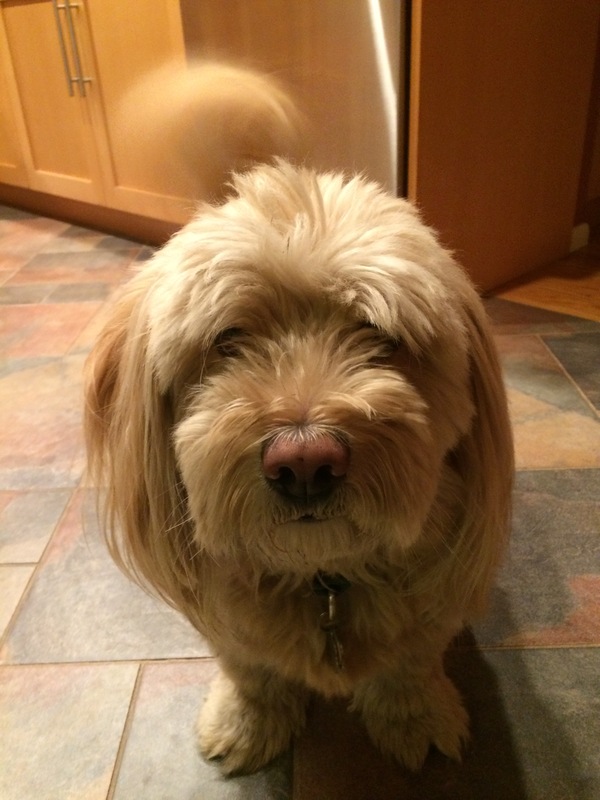 Thanks to our awesome pet sitter for taking good care of them. Sunday we woke up fairly early and realized it was the 1st Sunday of the month, and that means the Alameda Point Antiques Fair, fondly referred to as “the flea”. I so do not need anymore stuff, but it’s always fun to go and I had some unspent money from the Scandinavia trip burning a hole in my pocket. First things first, as usual for me, coffee and food! I normally drink decaf, but I ended up caffeinated in Europe, and what with the jet lag and all, I thought it was a good idea to get a double cappuccino. Warning–don’t shop under the influence of caffeine! 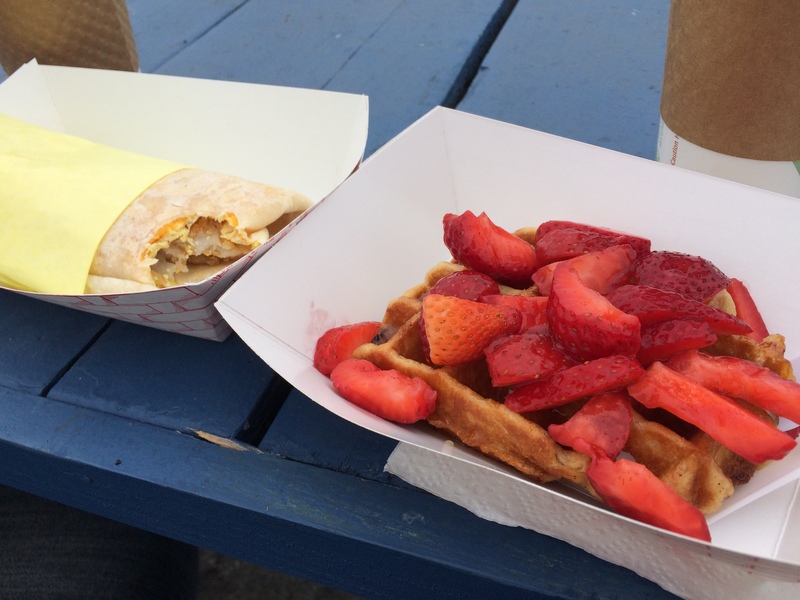 One of us (me) missed the beautiful strawberries in Norway so I went to the waffle truck and got a lovely waffle with strawberries. Tho other of us missed his usual “American” breakfast ingredients of eggs and cheese, so he went for the breakfast burrito on the taco truck. 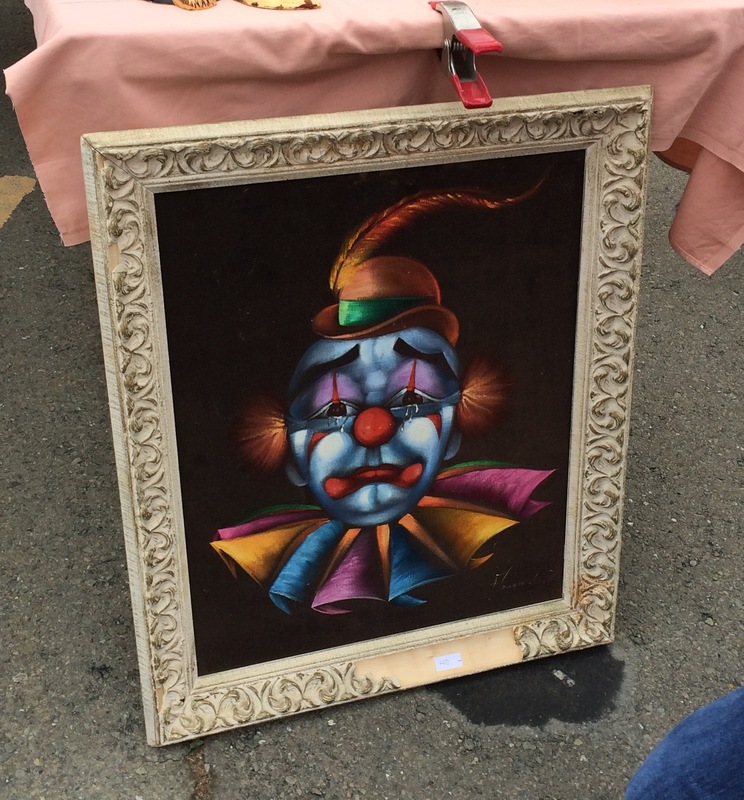 One of my favorite things to do is look for the ugliest thing I can find. 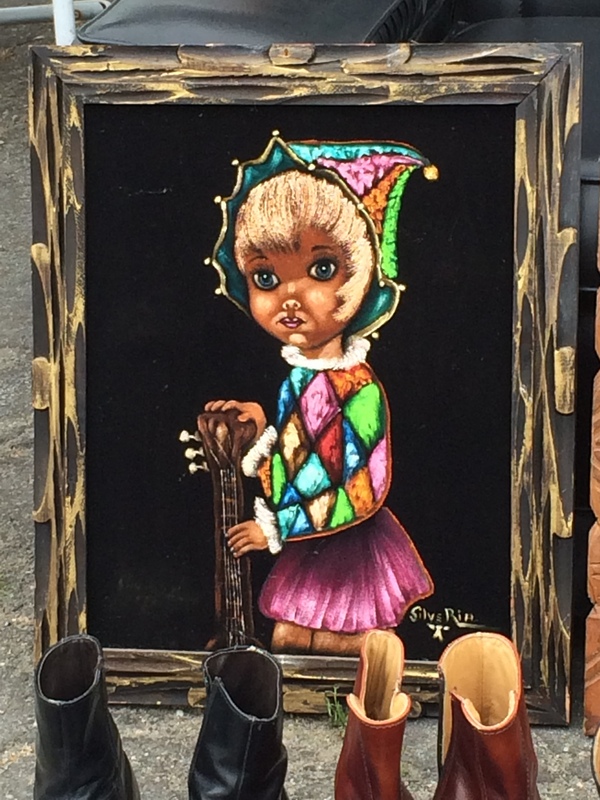 I usually exclude paintings on black velvet because they would pretty much always win. But there were 2 this time that were so horrifying I gave them a shared prize. Of course, I can’t resist used books. In addition to the 1957 illustrated edition of Henrik Ibesen’s Peer Gynt that I had to buy given that we had just been to the Ibsen Museum, I saw quite a few fun books. 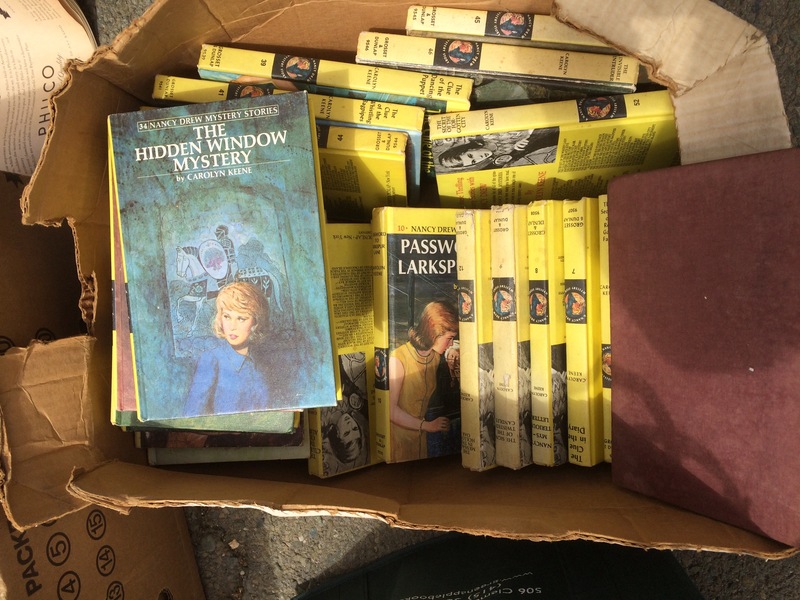 Who doesn’t love Nancy Drew? 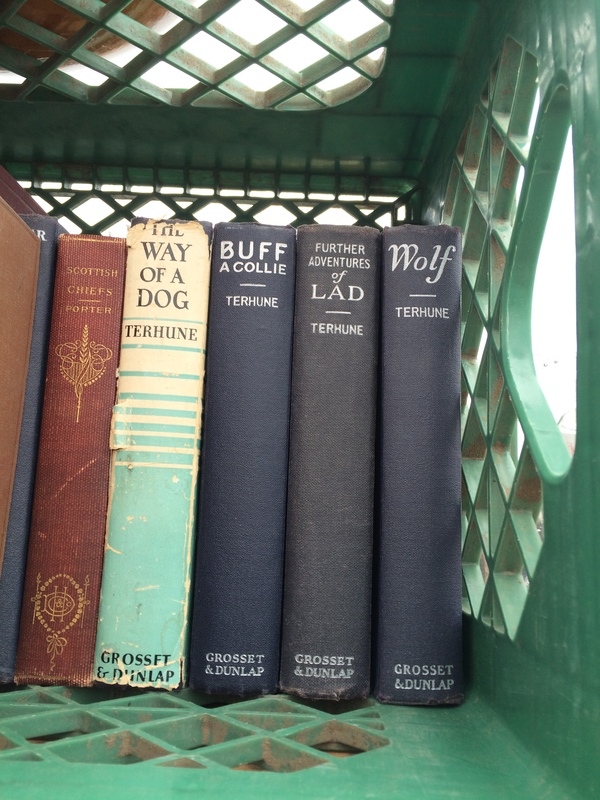 And a moment of nostalgia for the Lad: A Dog books by Albert Payson Terhune. We had them on our book shelves when I was a child and I read (and reread) them all. I hate to leave, but vacations must end. It’s been a wonderful, unforgettable week in Oslo. And a good time in Stockholm the week before. But something about Norway really grabs my heart. Perhaps it was finding the perfect place to stay on the fjord, or the kind and hospitable people, or the beautiful landscapes, or all of the above. I hope to return!